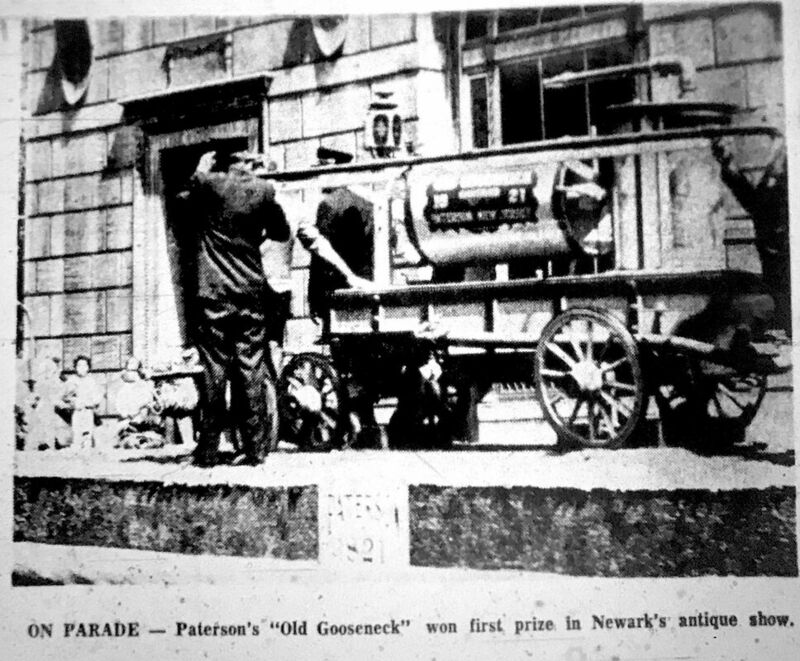 Exempt Firemen pulling "Old Gooseneck"
Old Gooseneck on float, trailed by a gig-pulled second float carrying the 1863 Jeffers Steamer of Washington Engine 3. 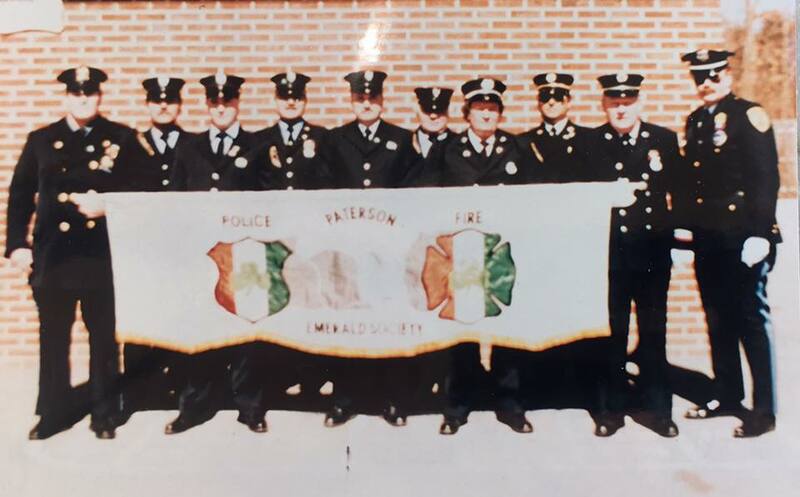 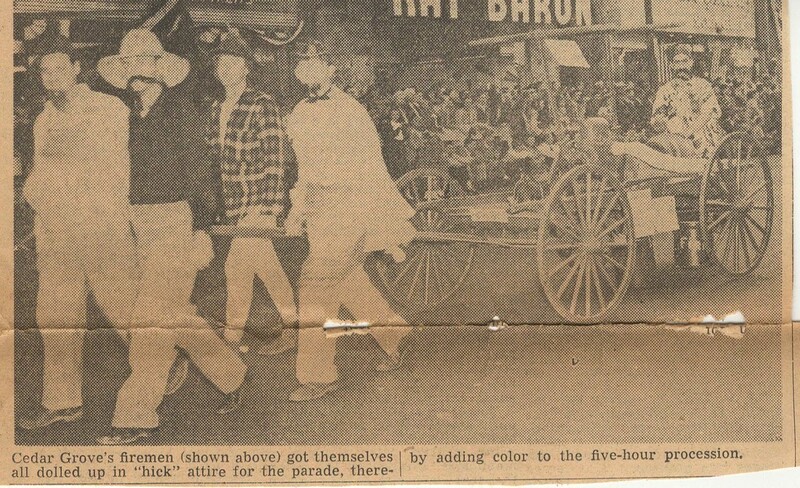 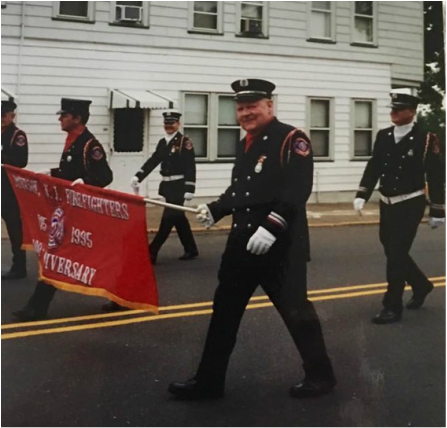 On float: L-R Jack Gregg, Tom Alala, Joe Forbes, Bill O'Neil, Roger Dumas, Henry Harris, Joe Parkin Sr., a very well dressed Joe Parkin Jr. (a future PFD Captain) and Bob Fisher. 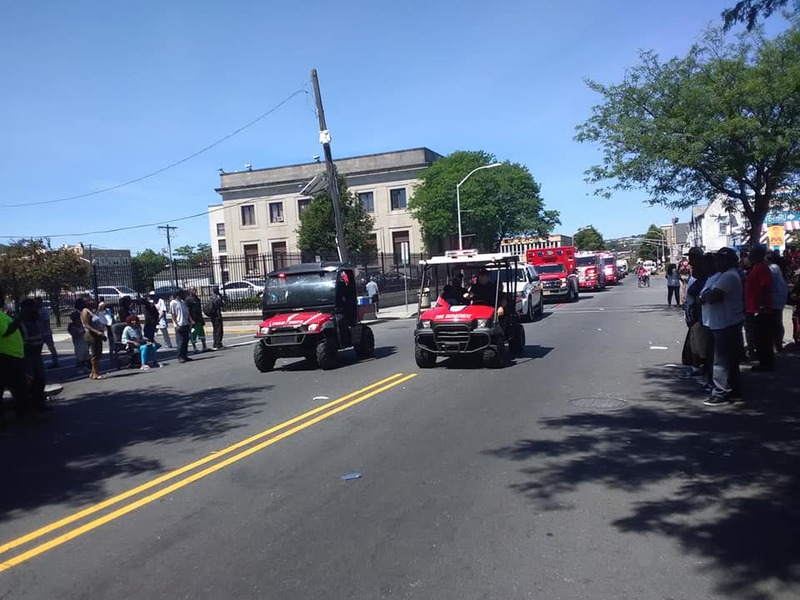 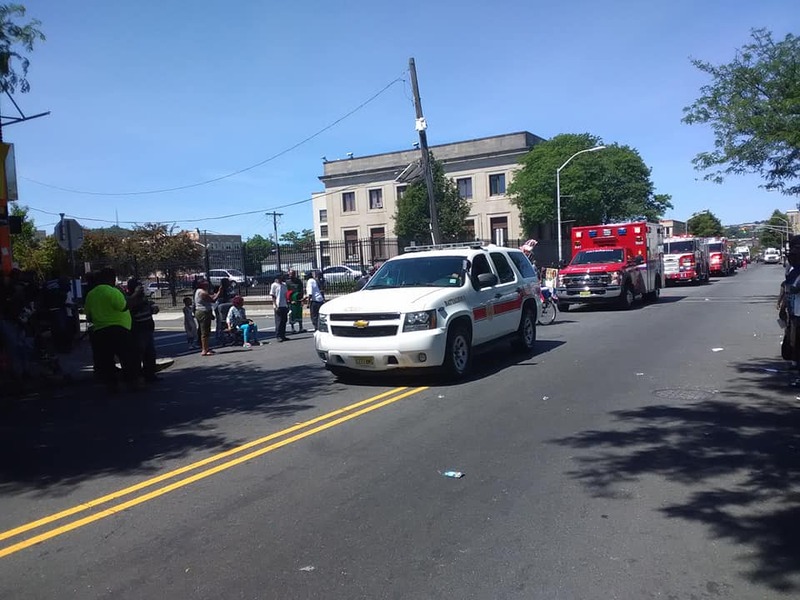 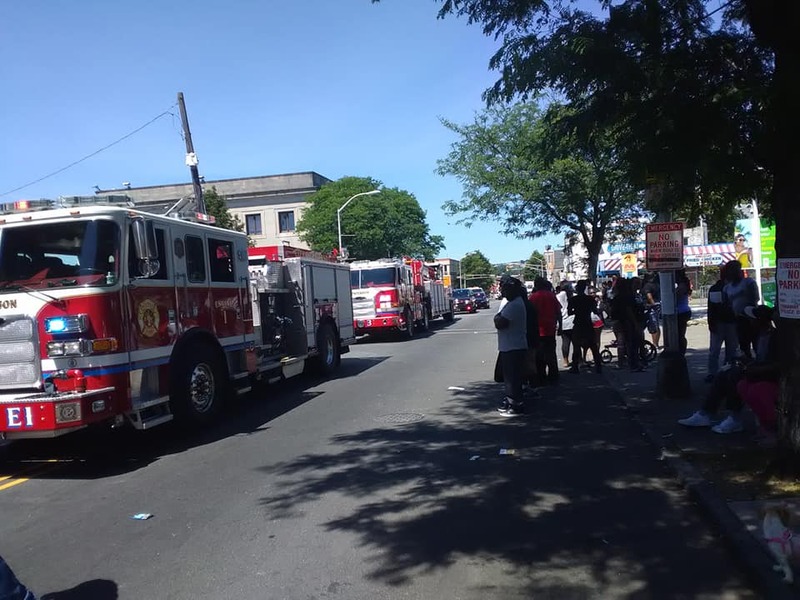 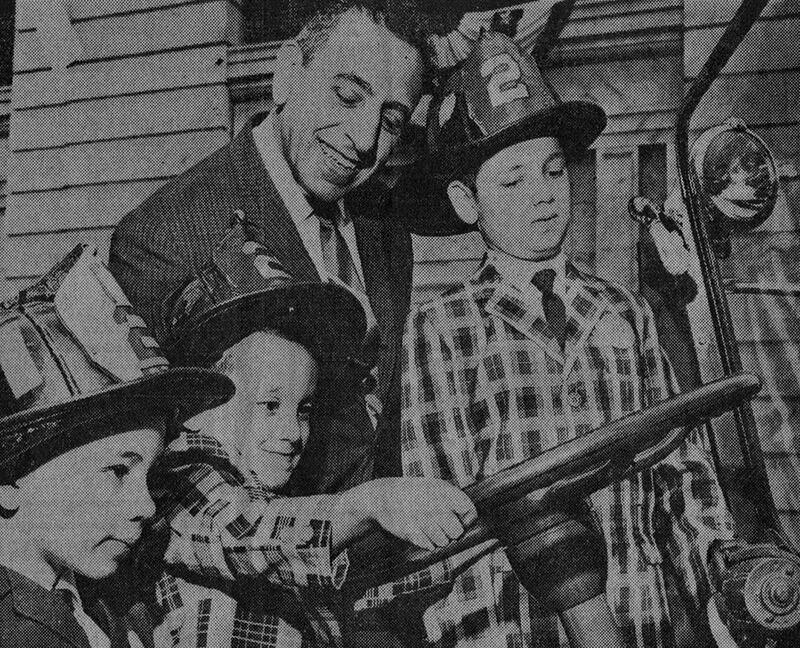 Children were treated to play firemen, policeman and mayor. 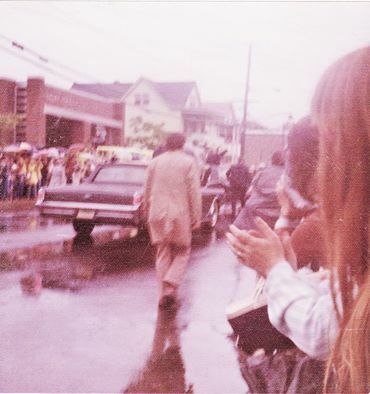 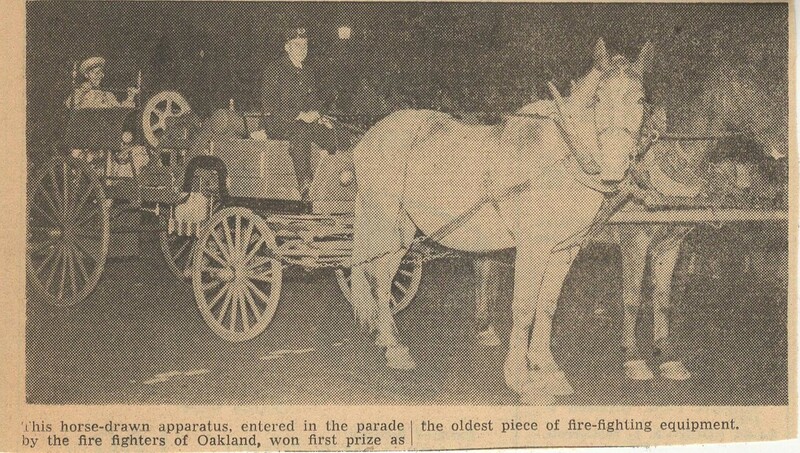 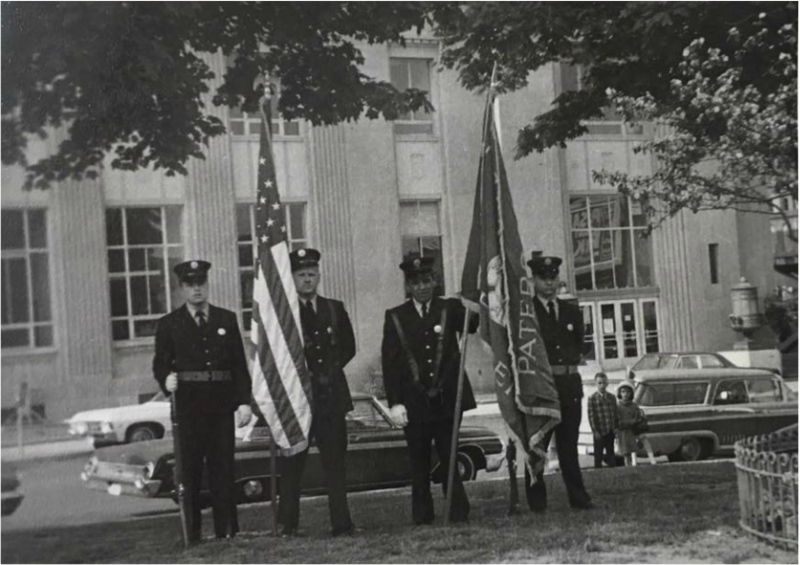 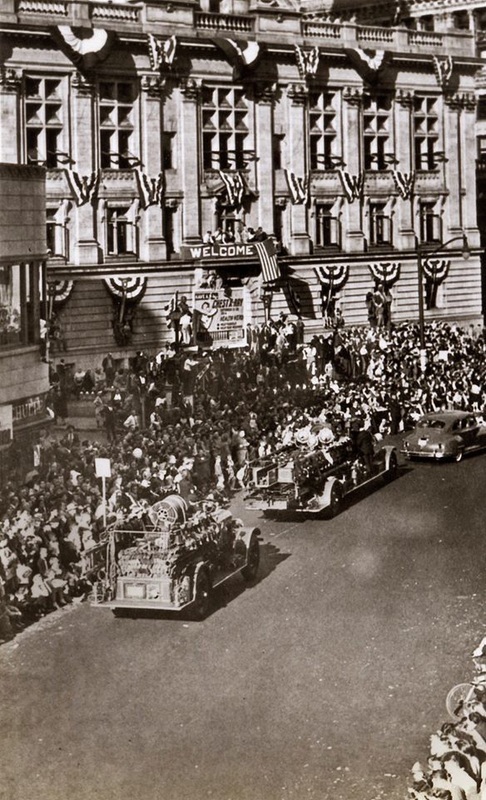 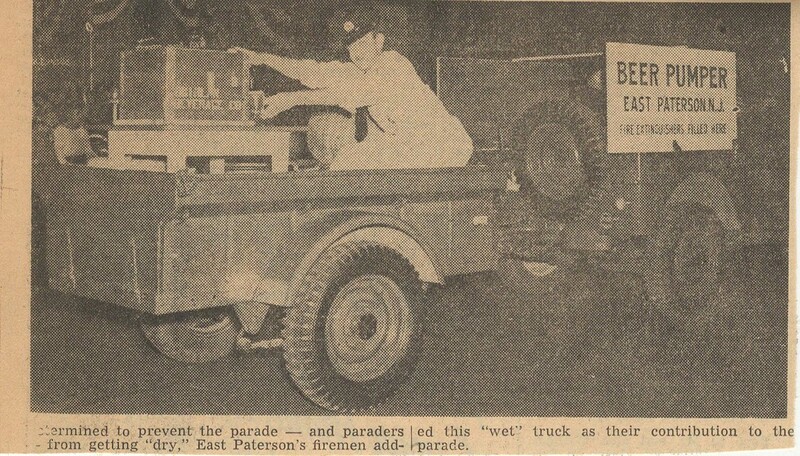 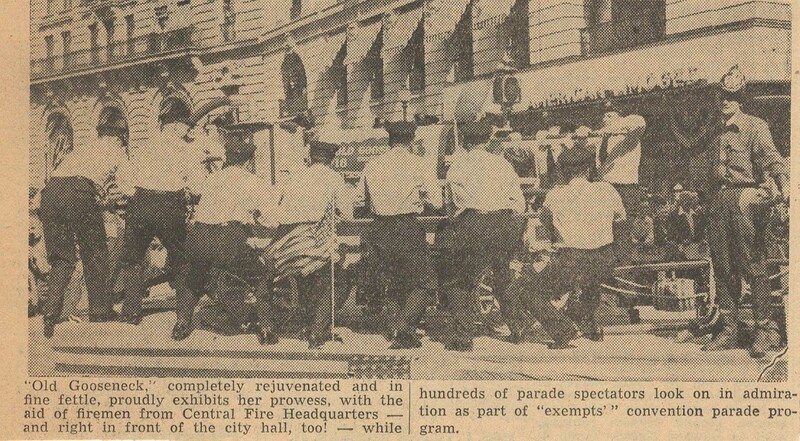 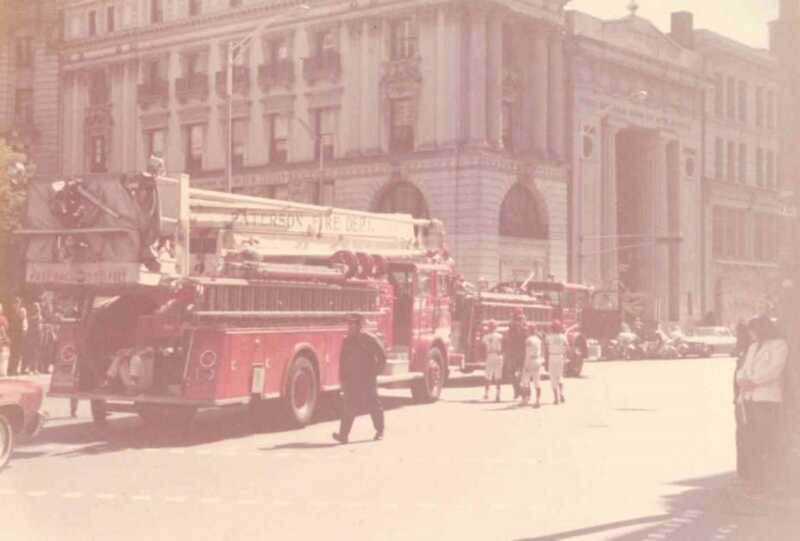 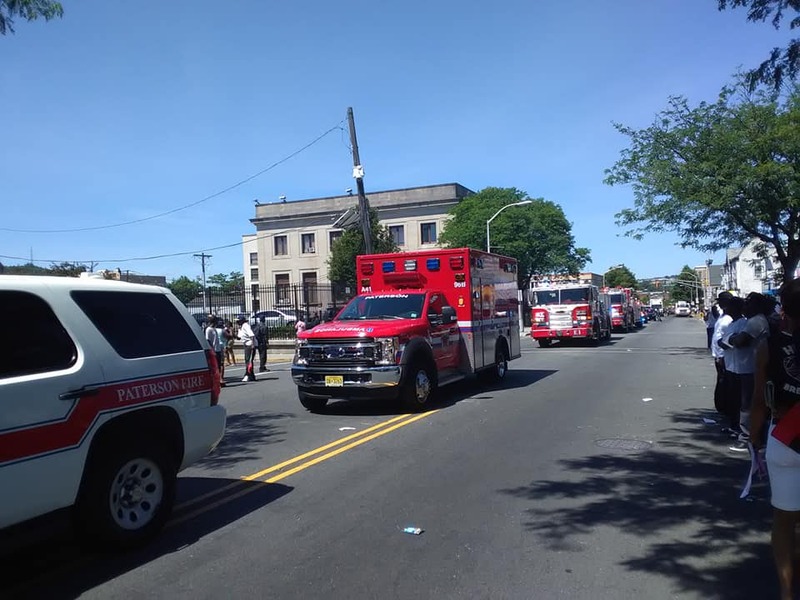 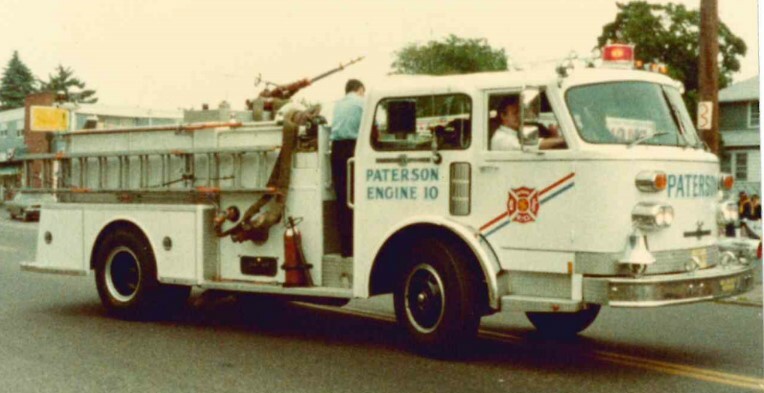 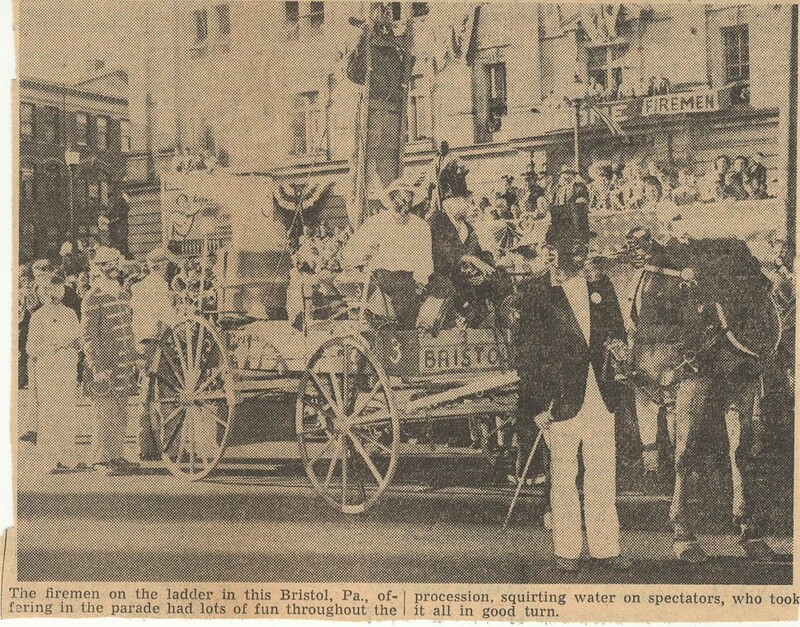 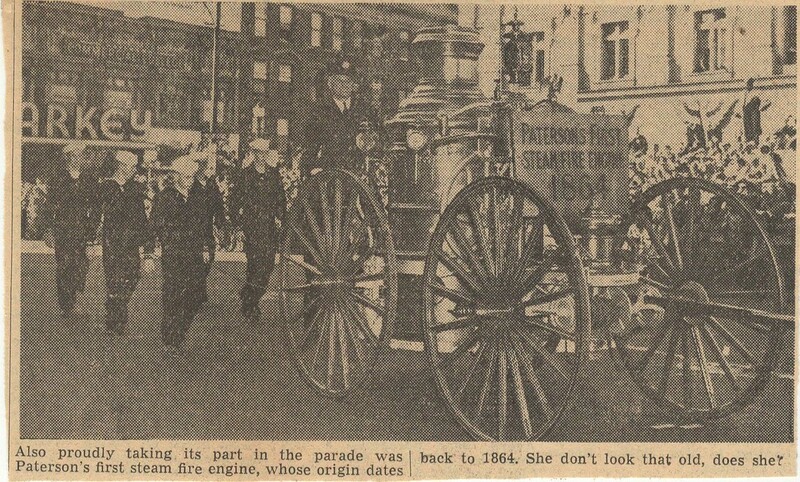 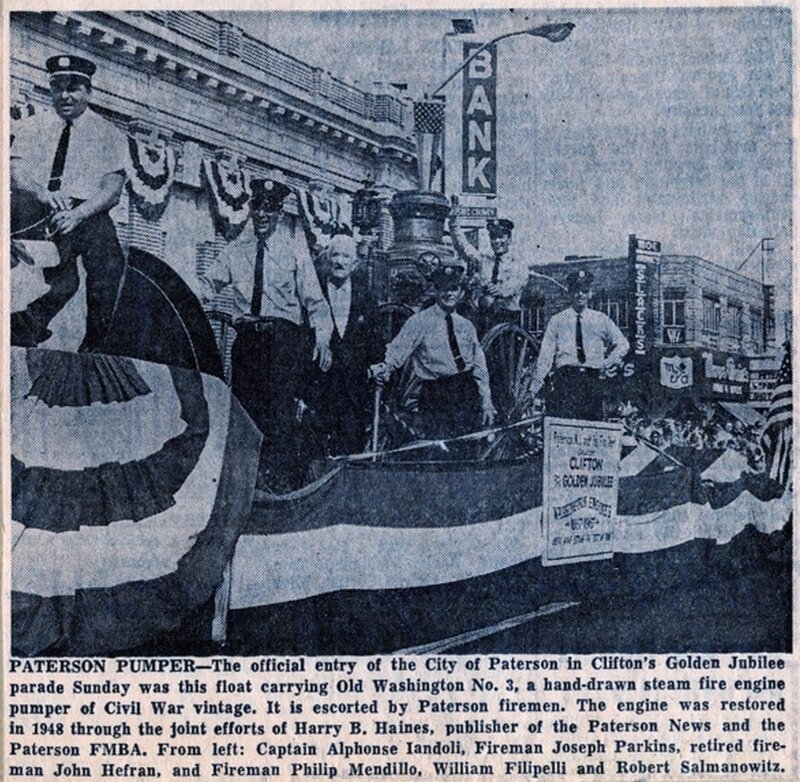 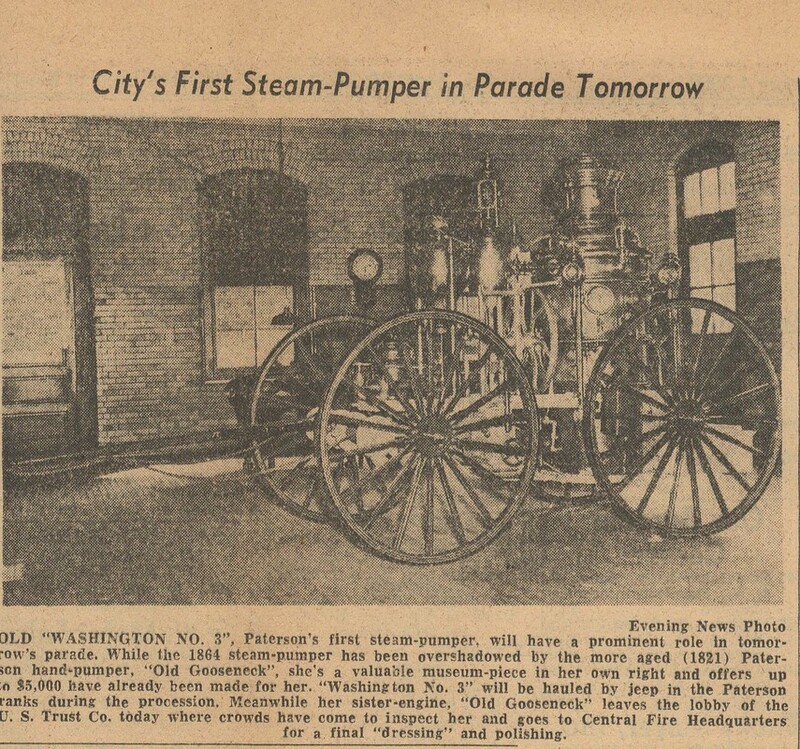 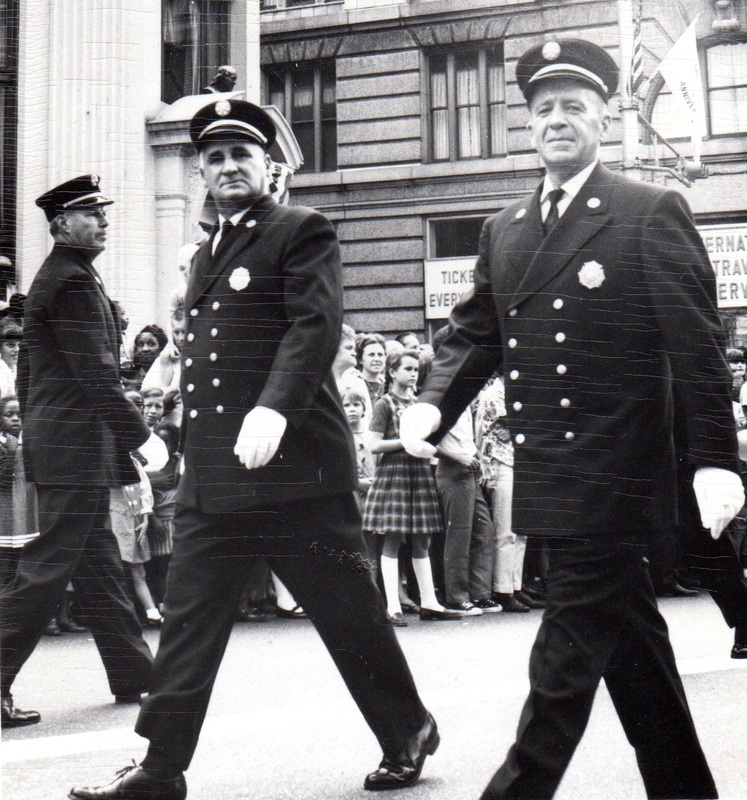 In front of City Hall was the Fabiano Family from Crosby Ave: Father Frank Sr. with Robert, Edward and Frank Jr.
1974 Little League Parade - Passing City Hall is the 1964 Pittman Snorkel (a spare at this time) preceded by a 1971 Hahn pumper (? 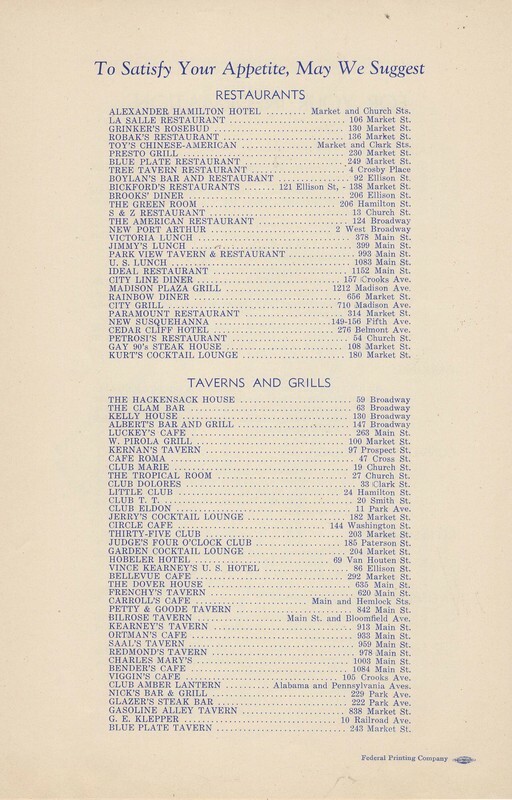 E1, E3 or E5). 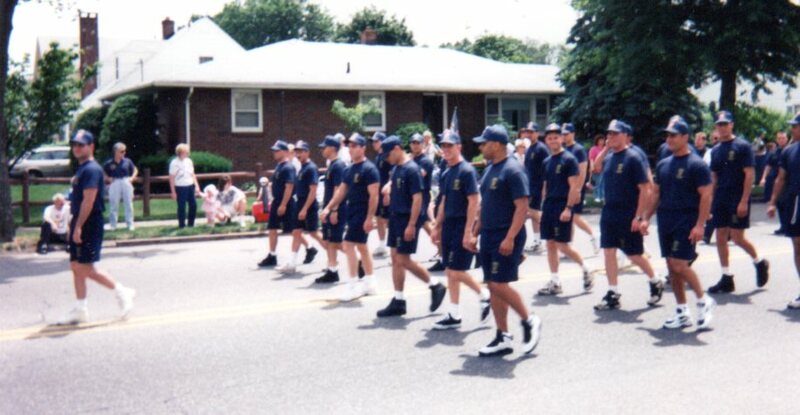 R-L: Capt. 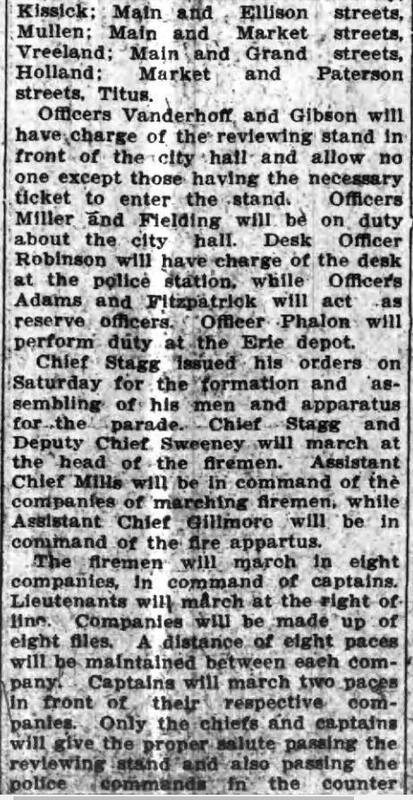 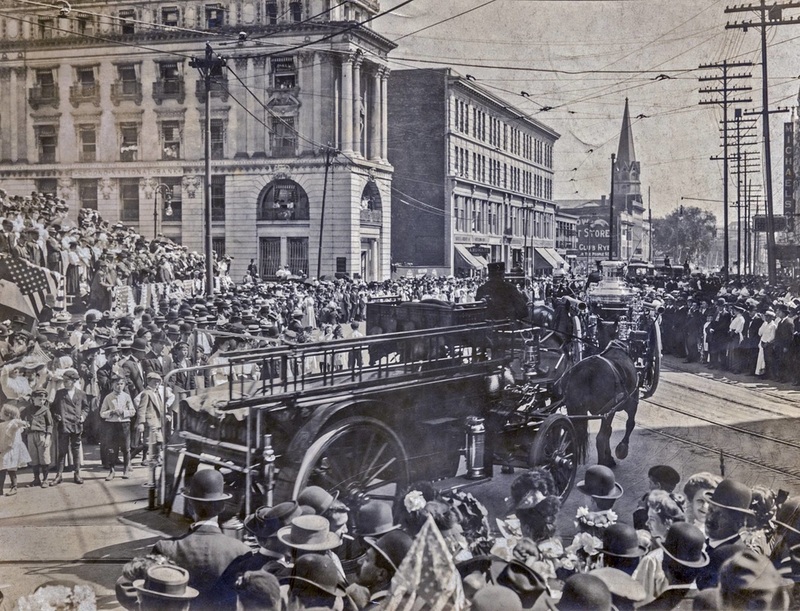 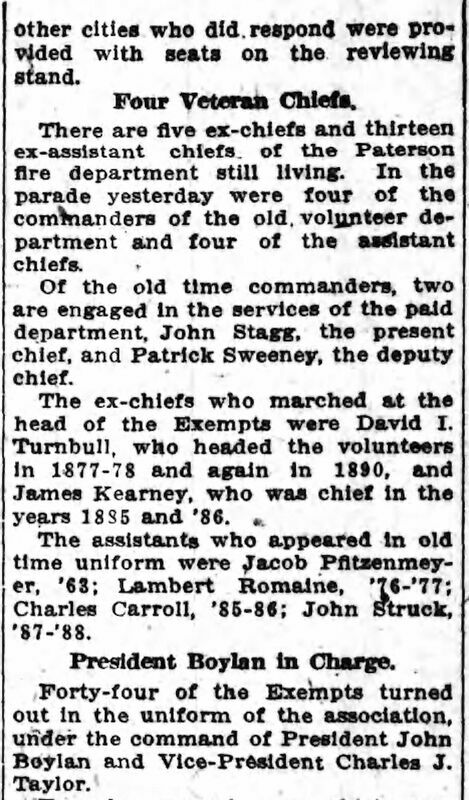 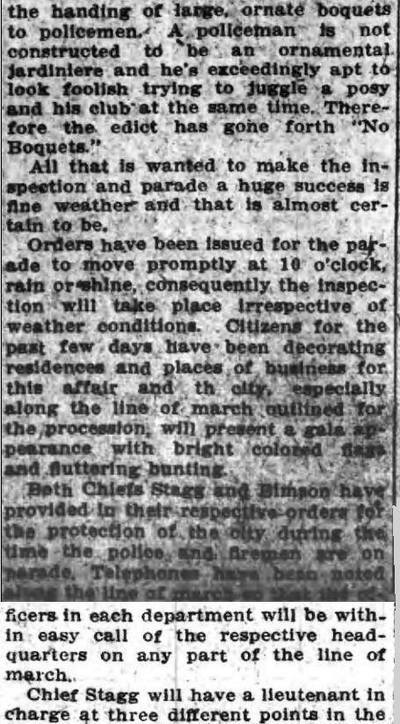 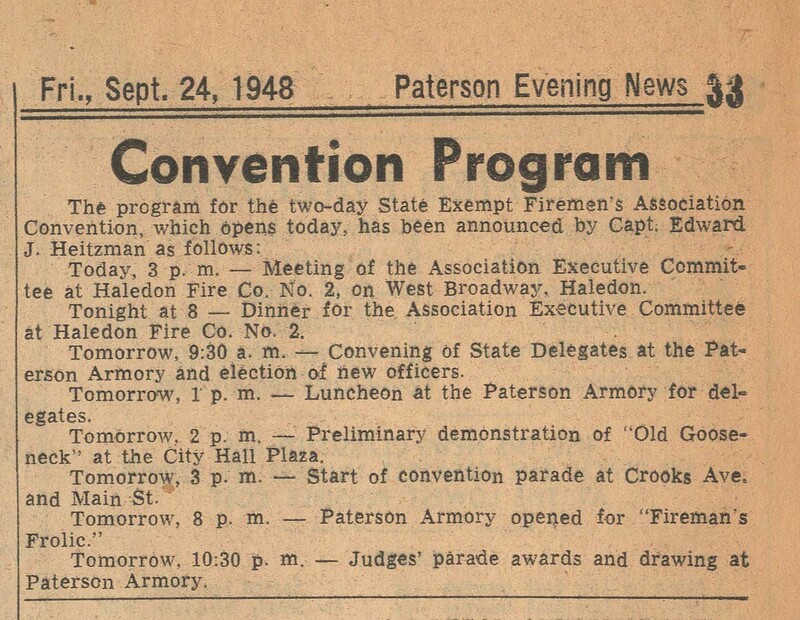 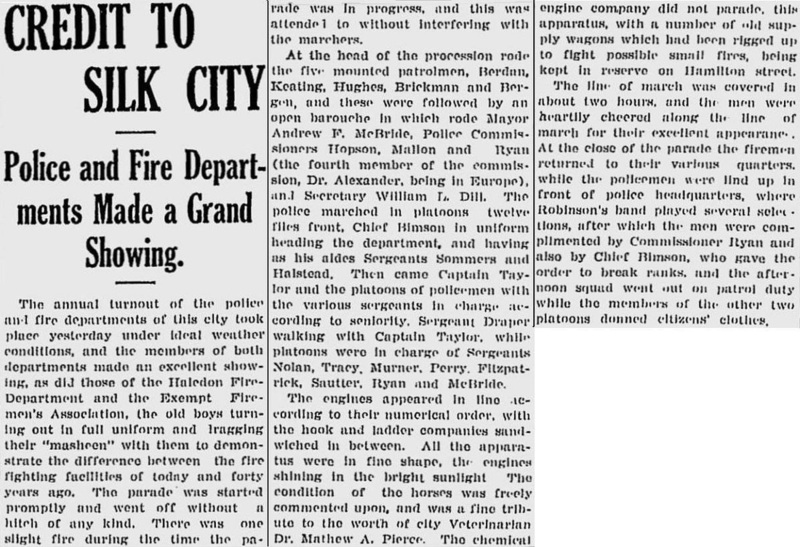 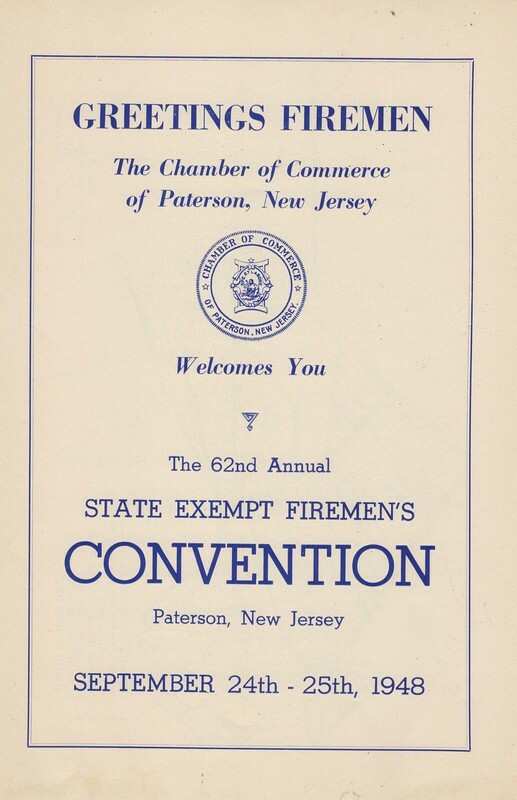 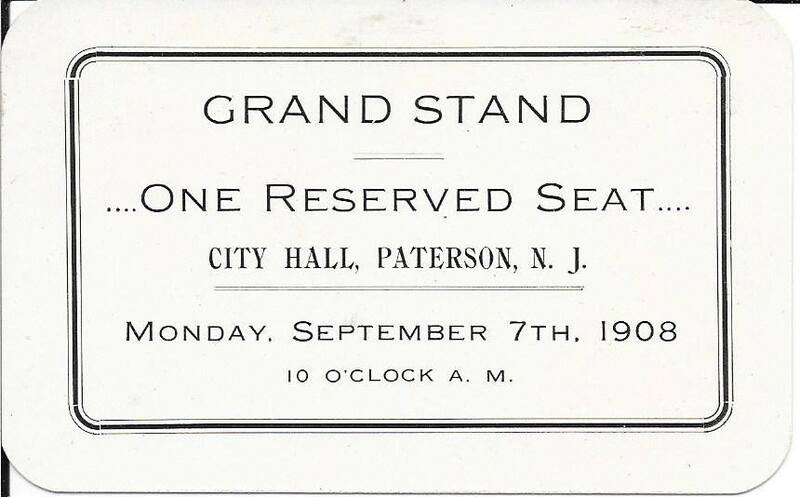 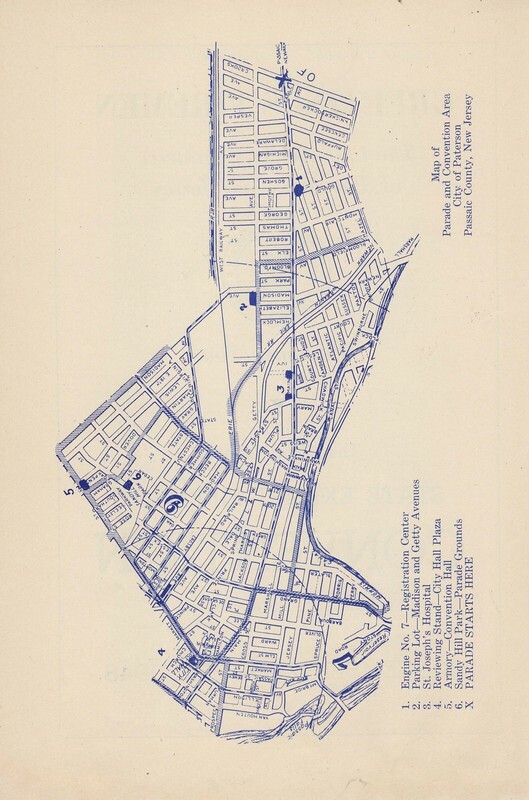 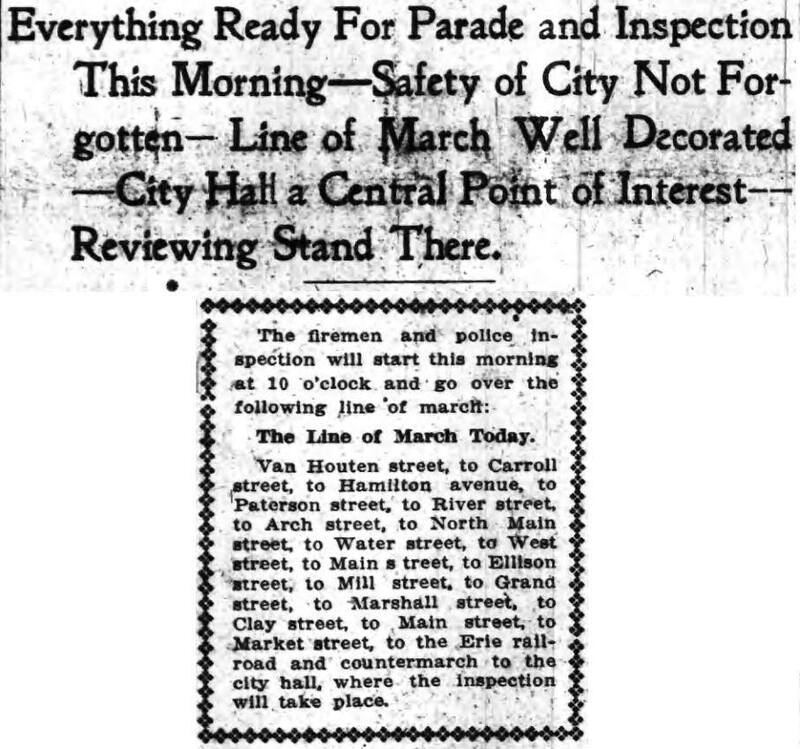 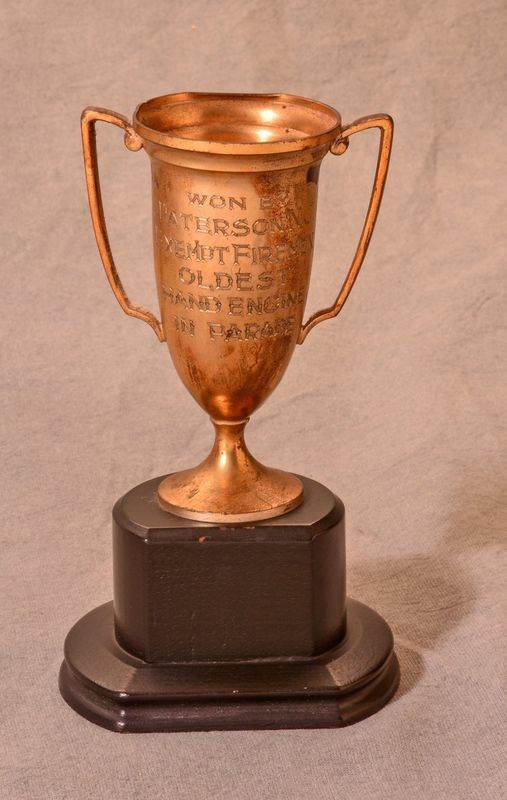 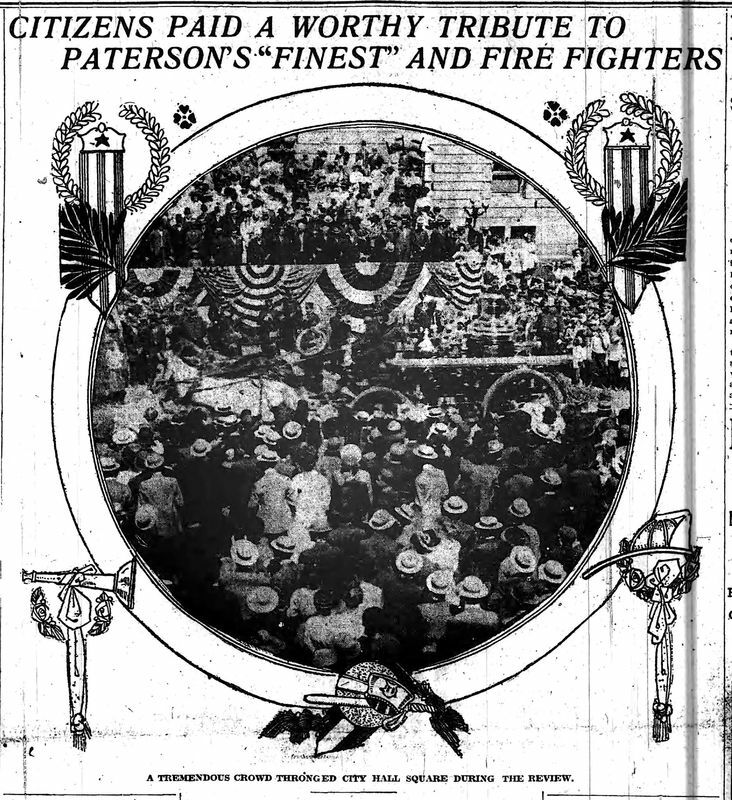 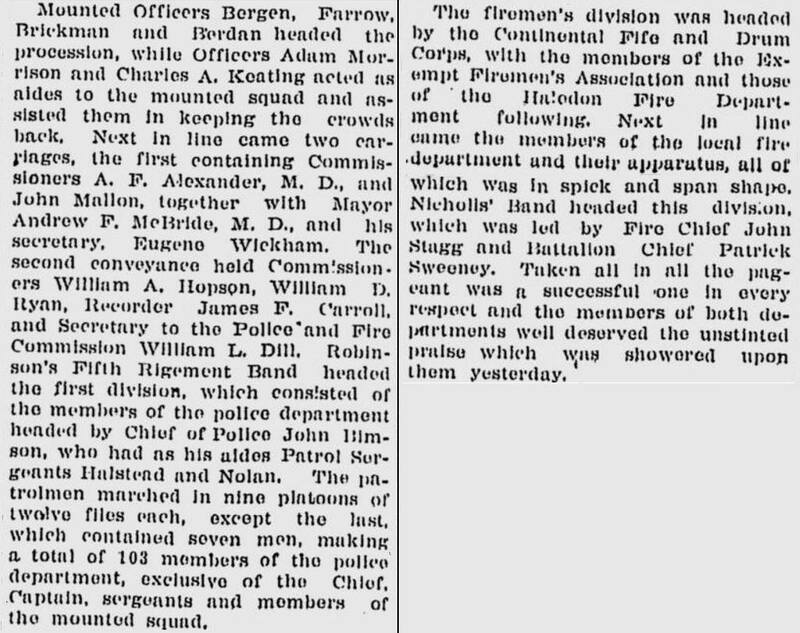 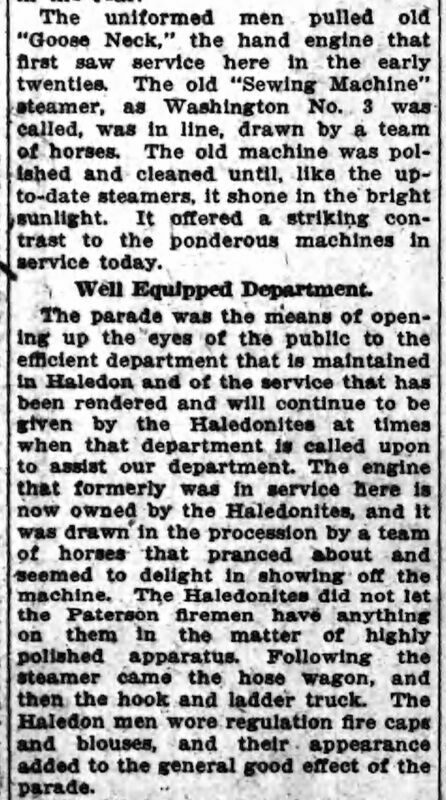 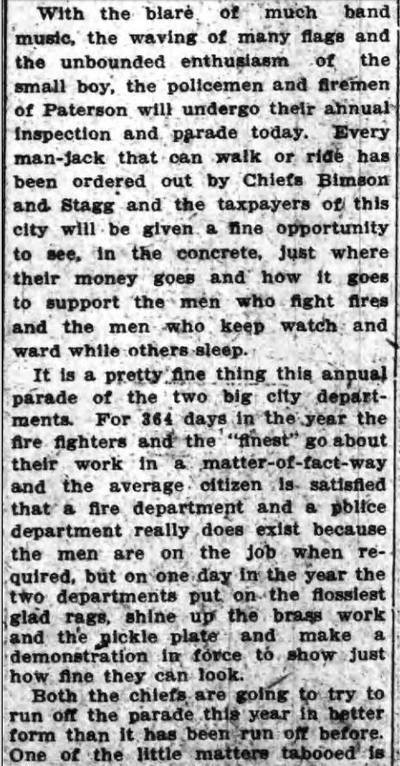 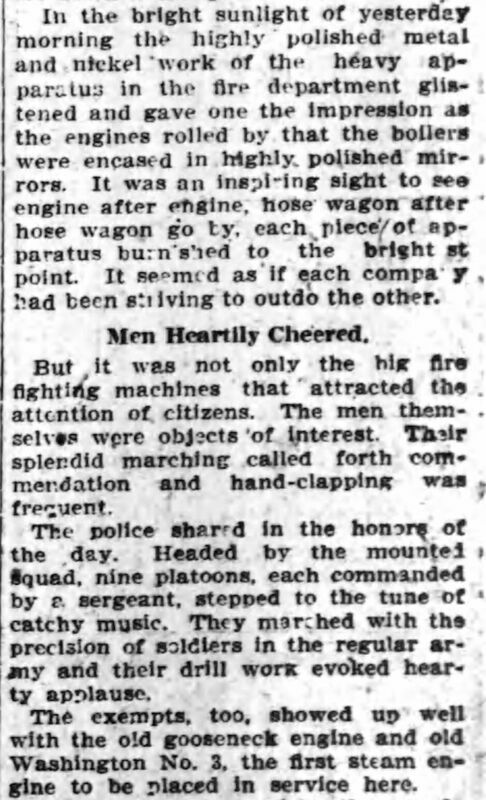 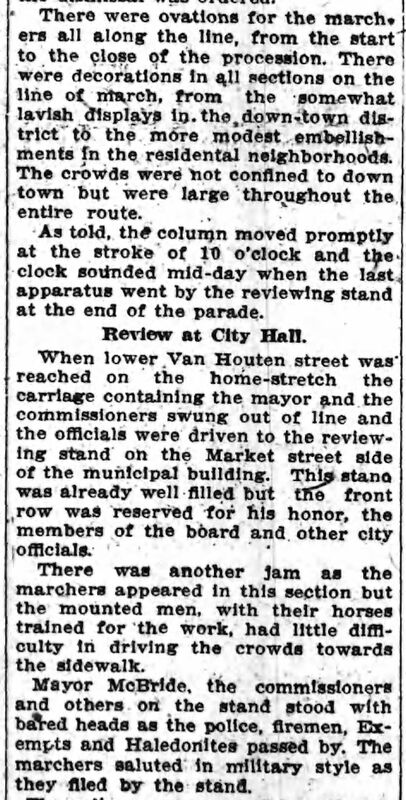 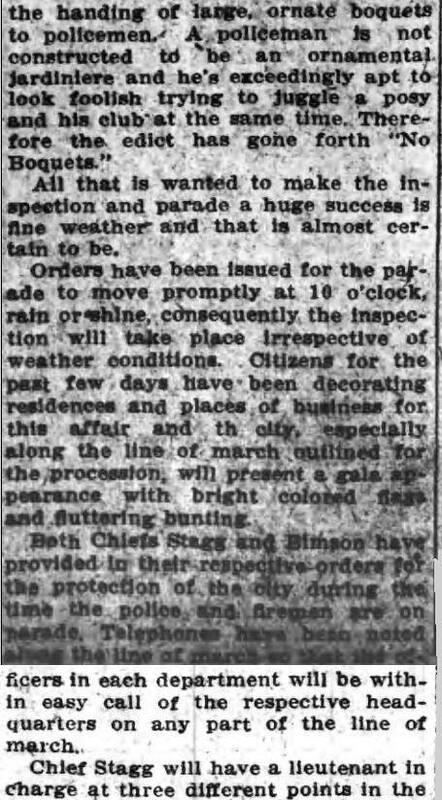 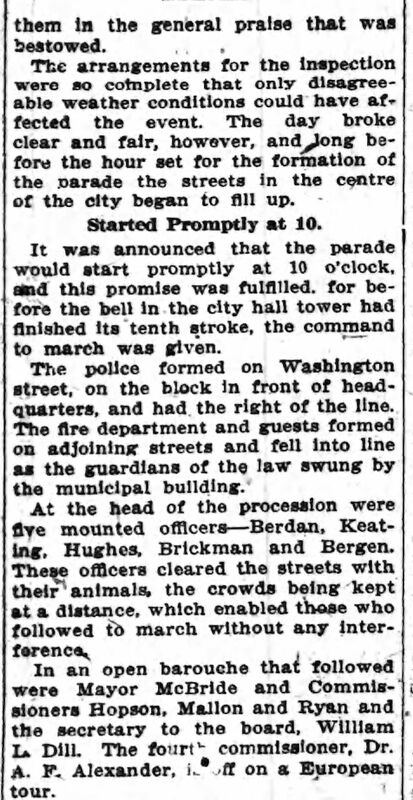 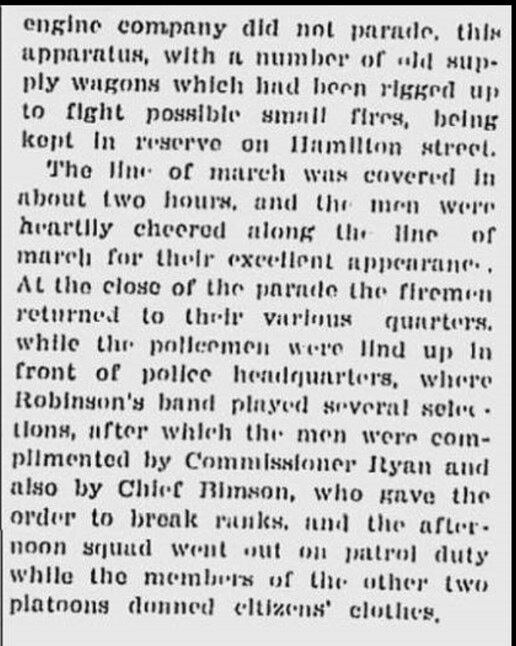 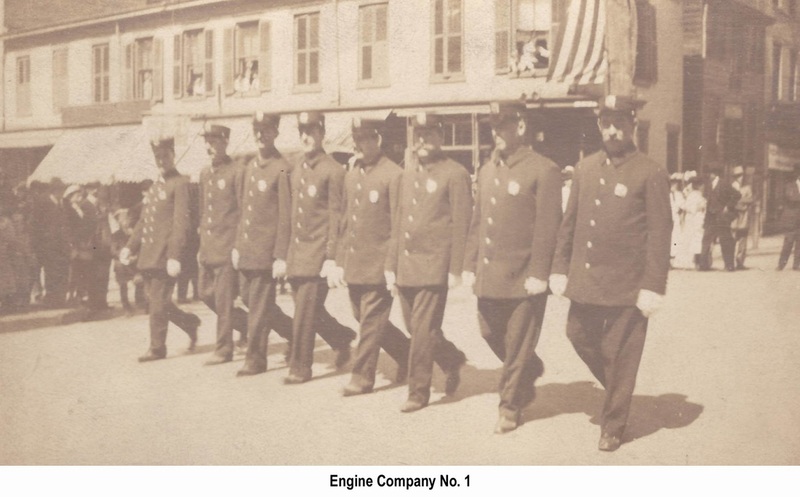 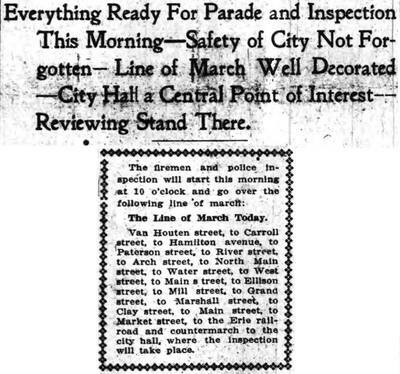 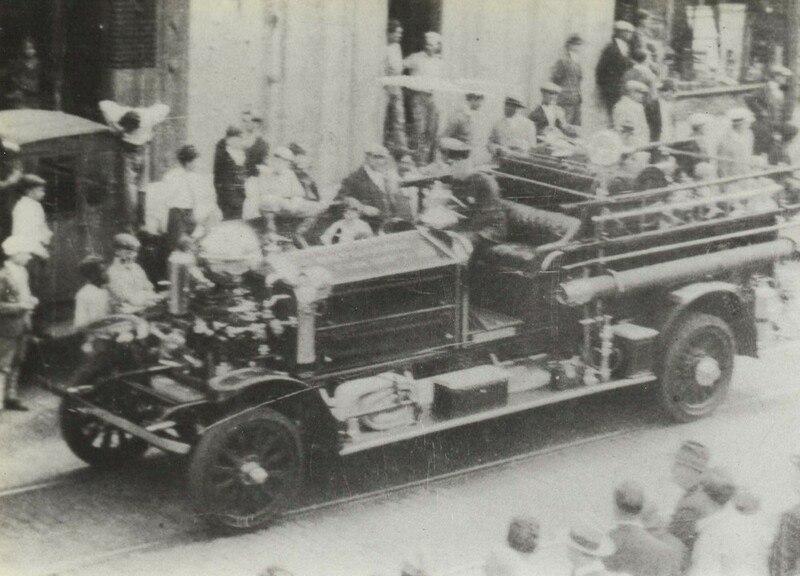 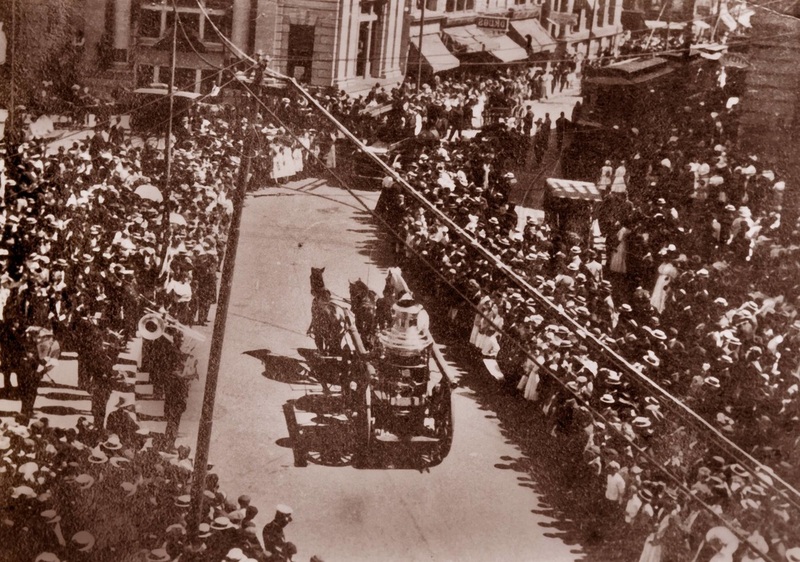 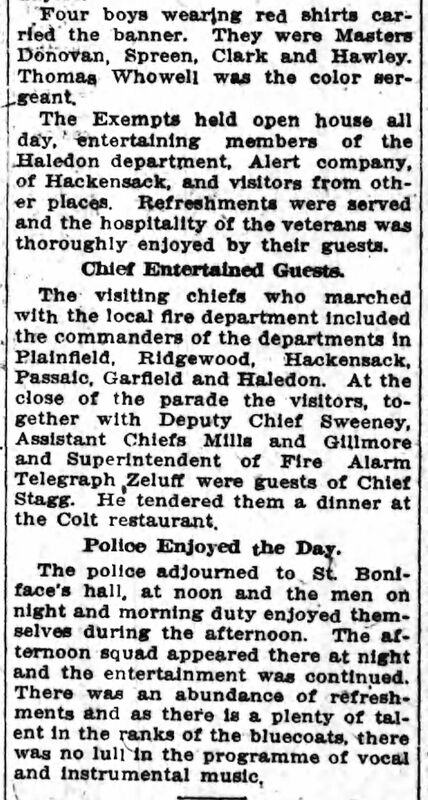 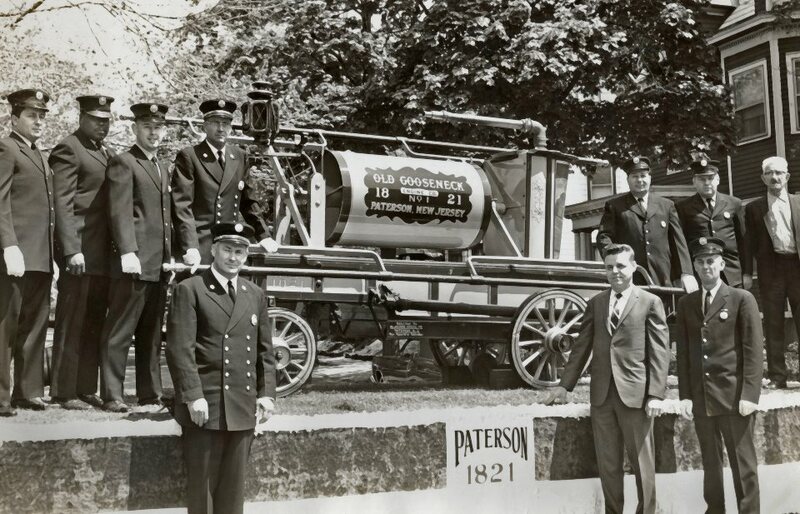 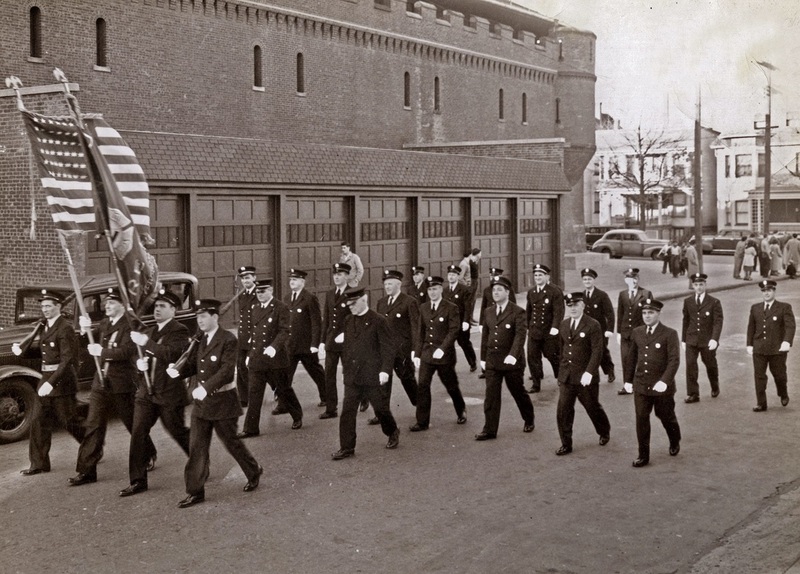 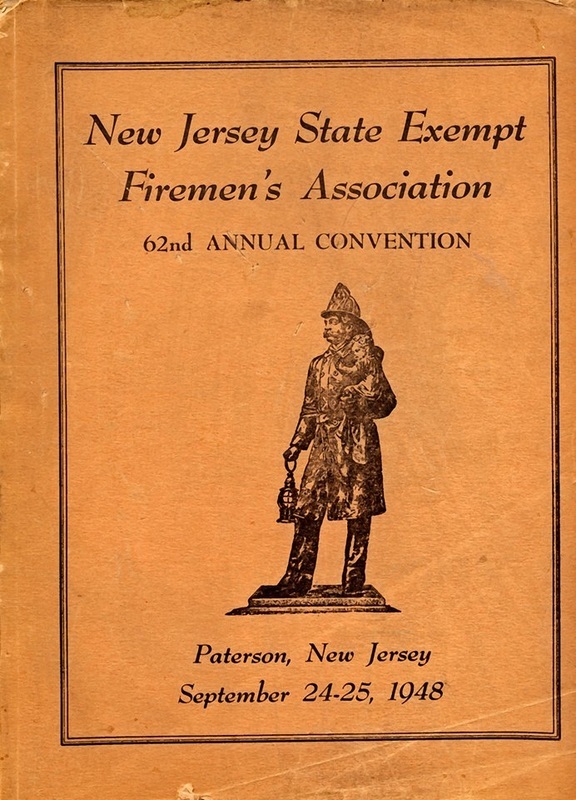 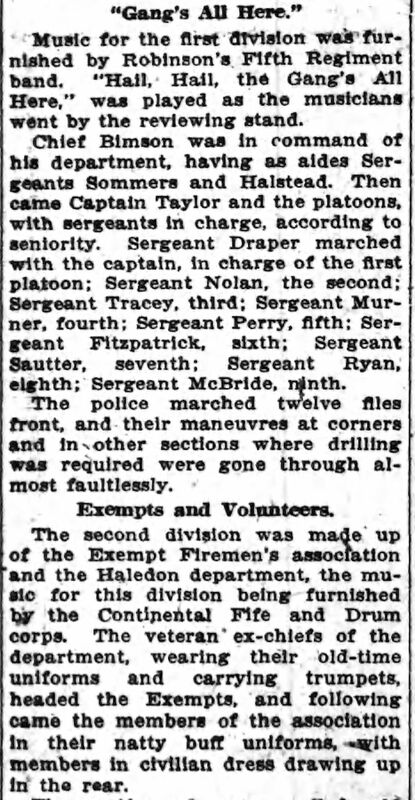 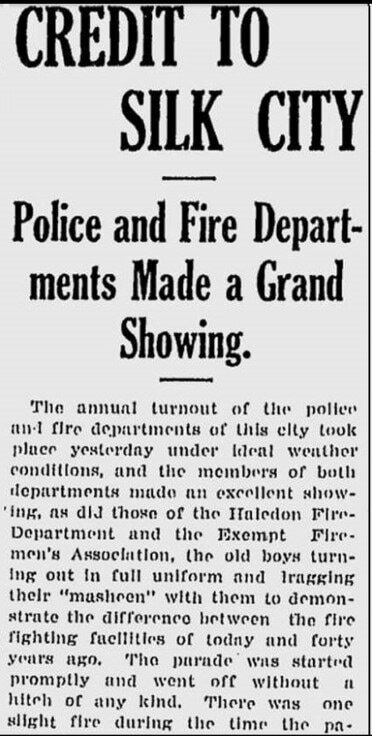 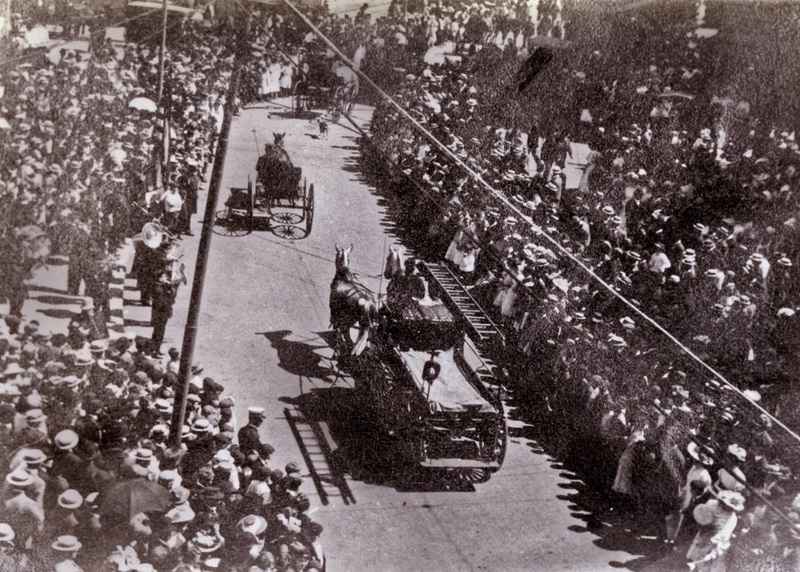 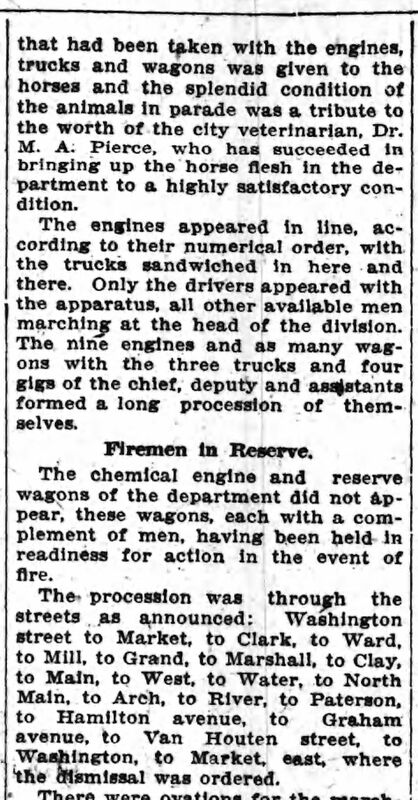 George Kilgour E. 8; Fireman Pellegrino C. Vitale; Fireman Roy Vonderhayden; Fireman William Downey; Bn. 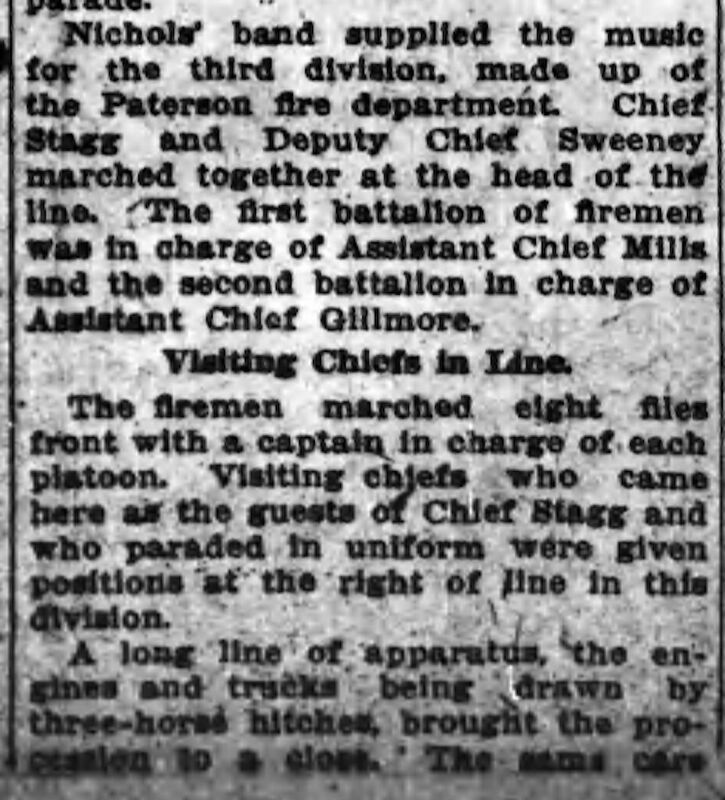 Chief Albert Capter; Deputy Chief Edward McLaughlin. 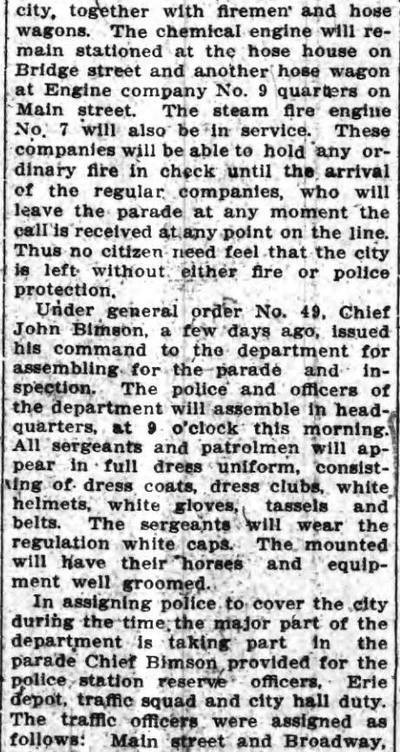 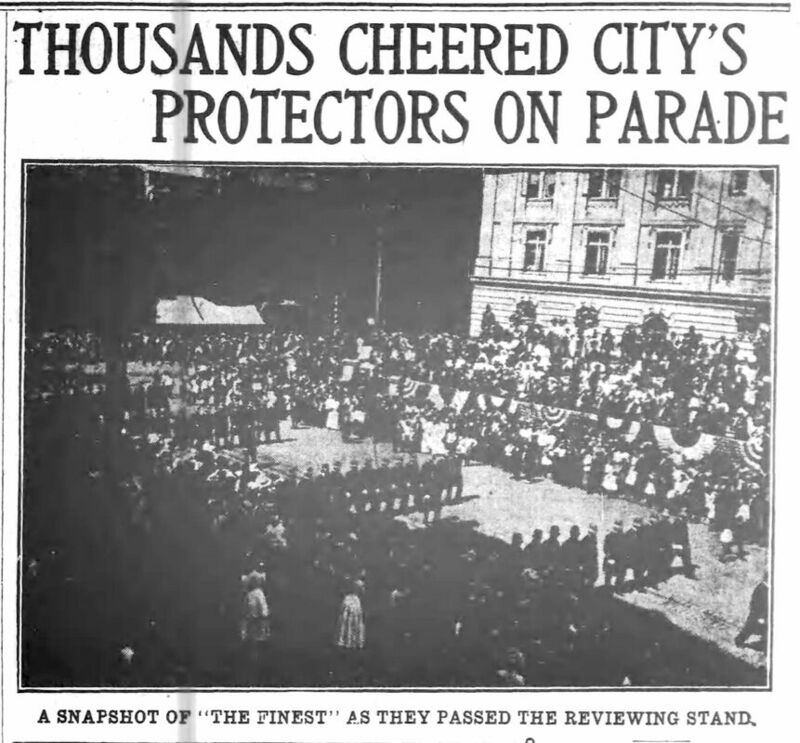 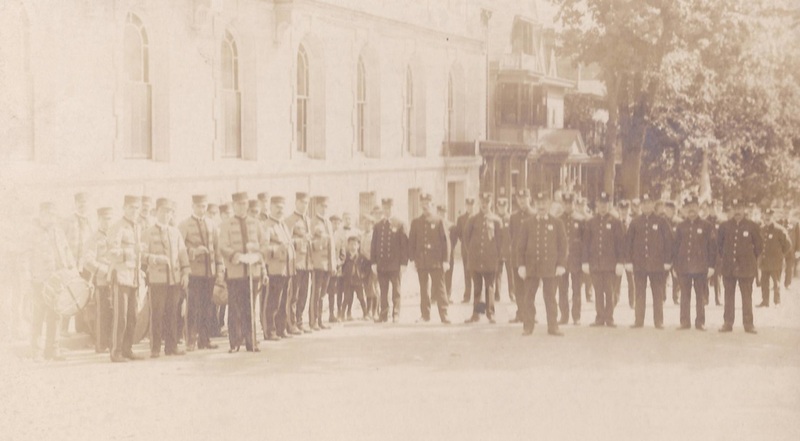 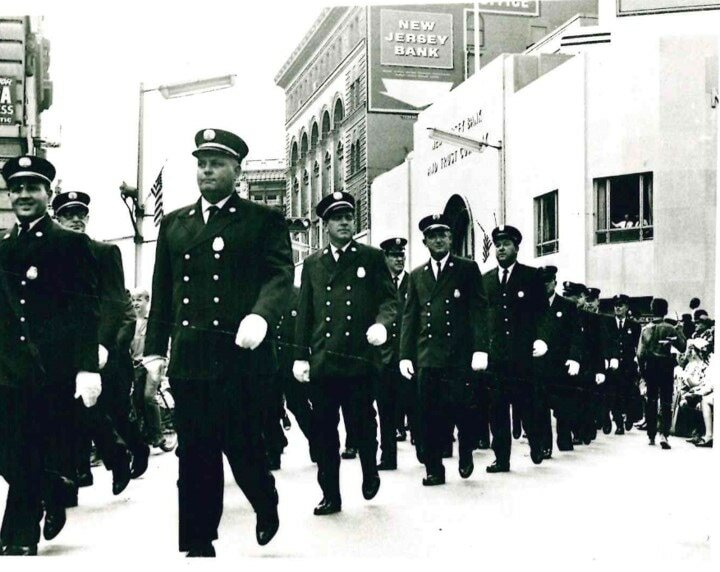 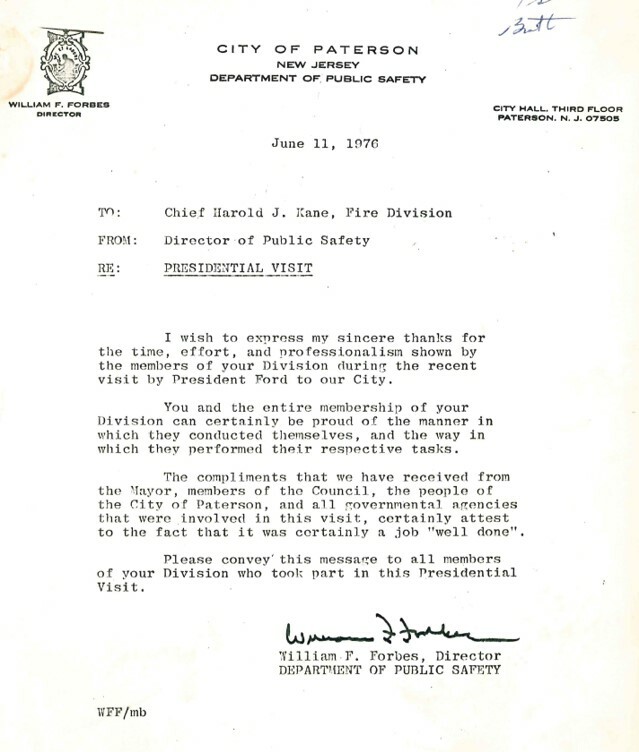 Front in Center; Civilian in Checkered Trousers is off duty Deputy Chief Edward J. Hancock. 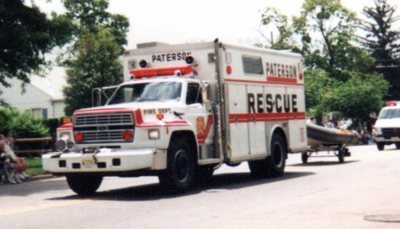 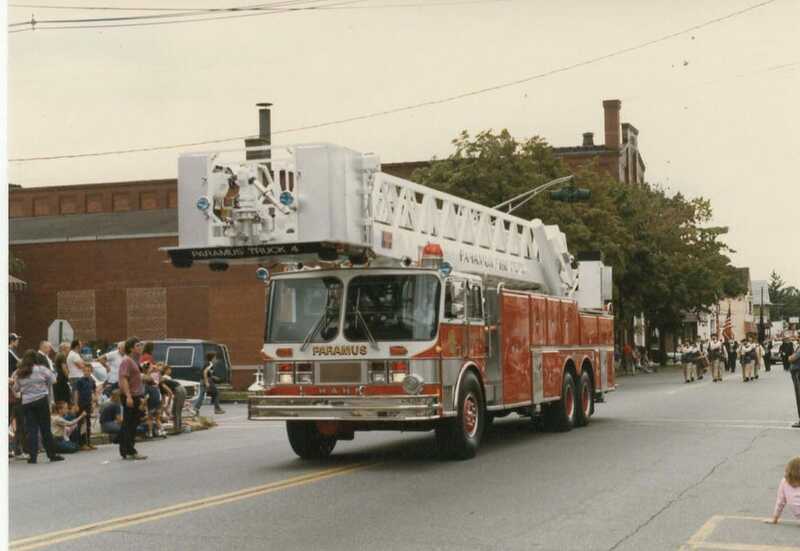 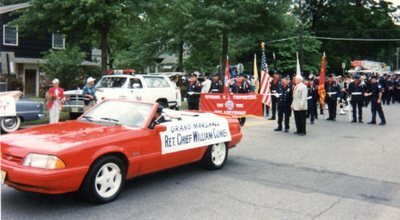 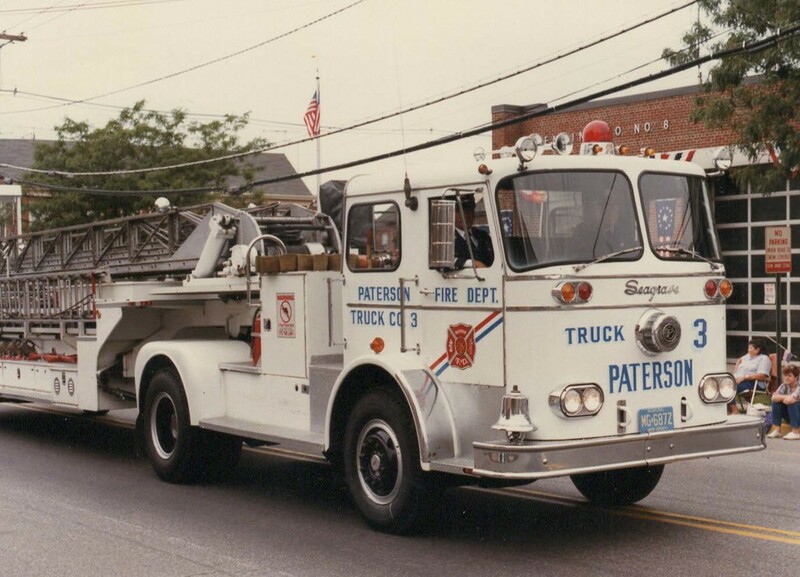 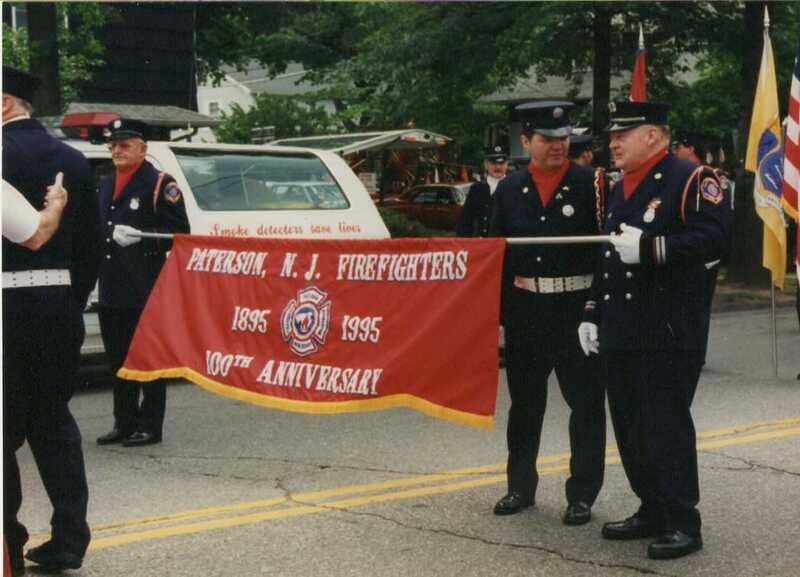 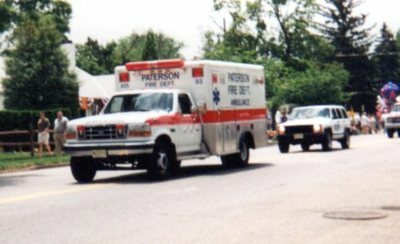 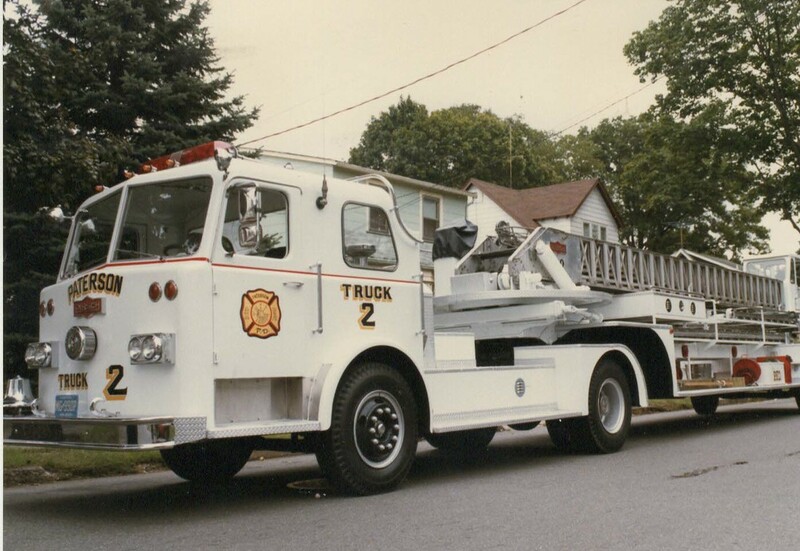 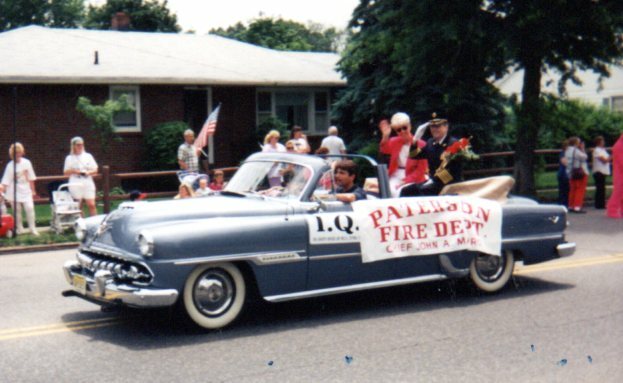 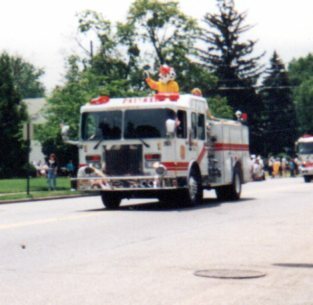 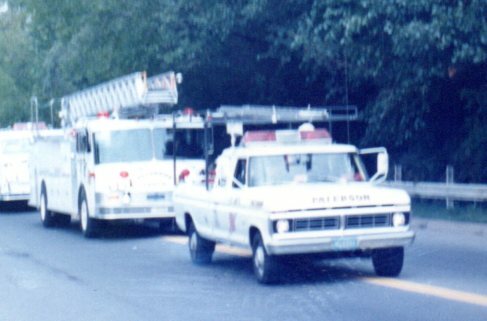 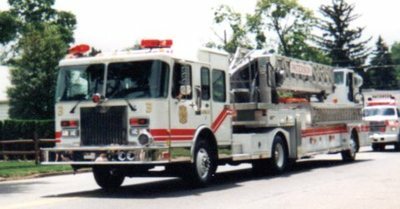 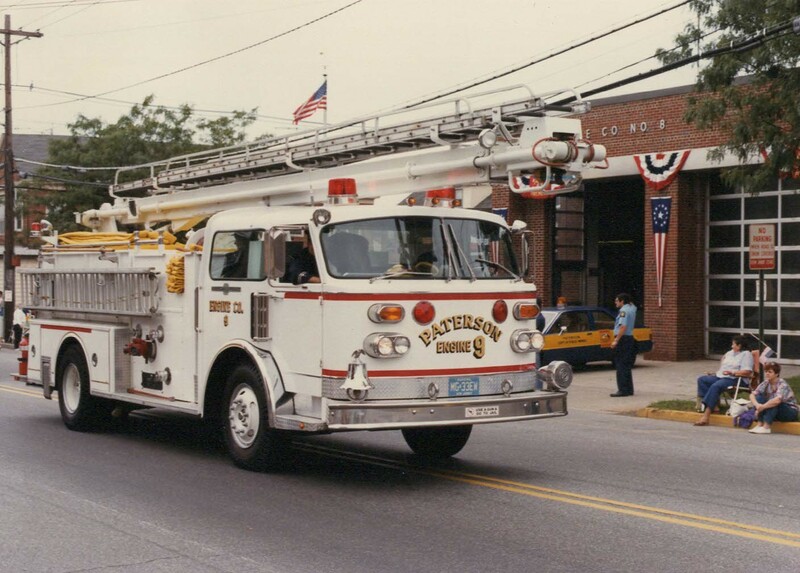 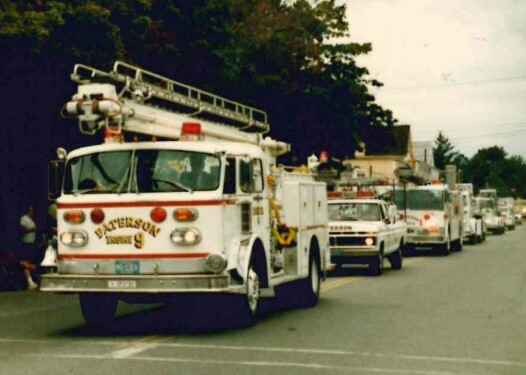 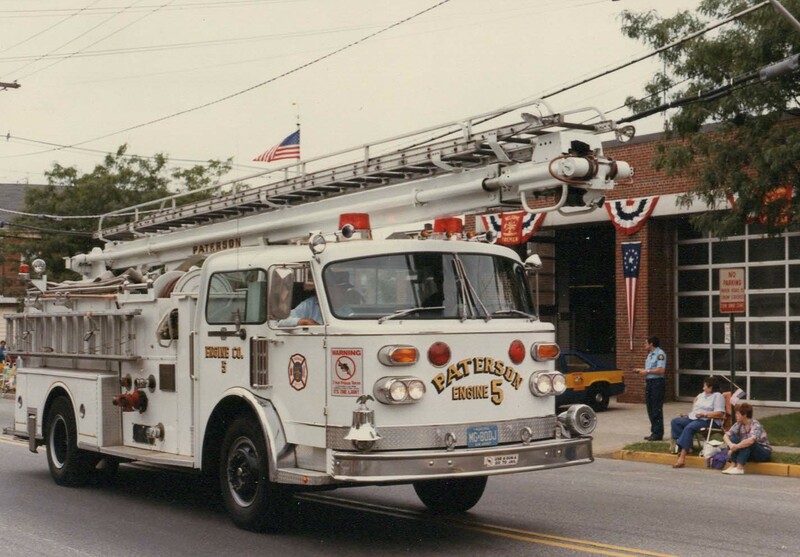 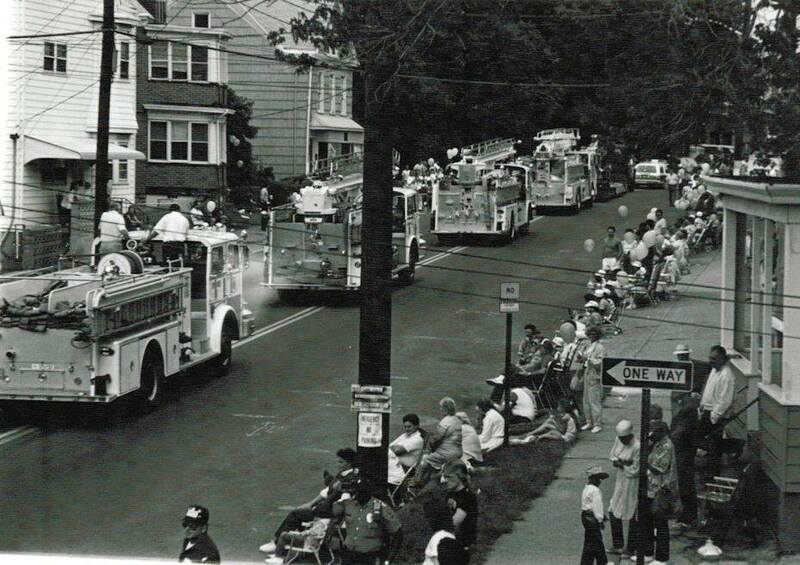 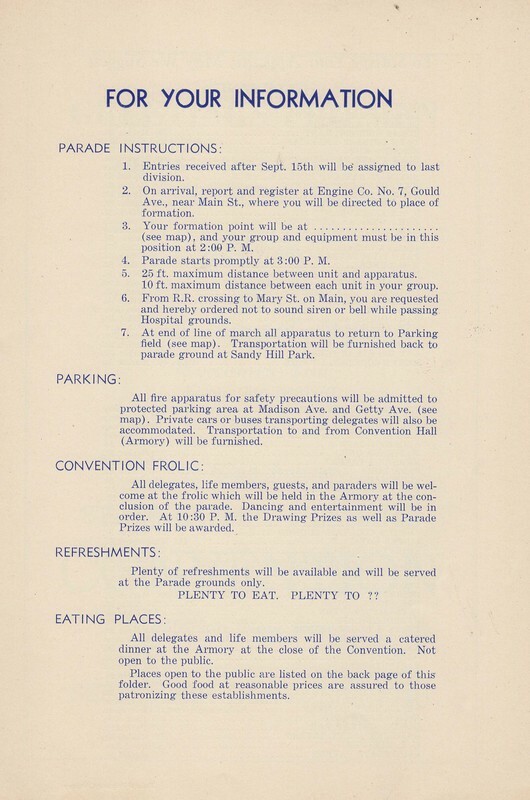 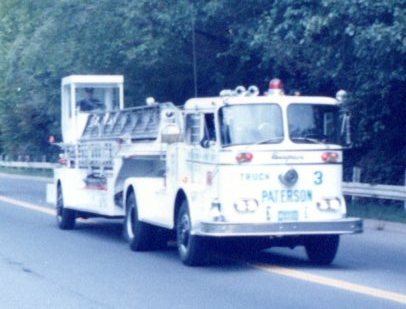 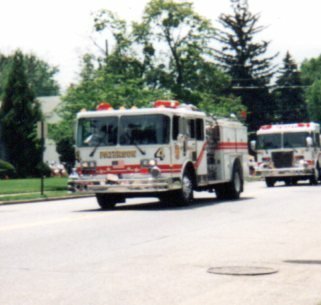 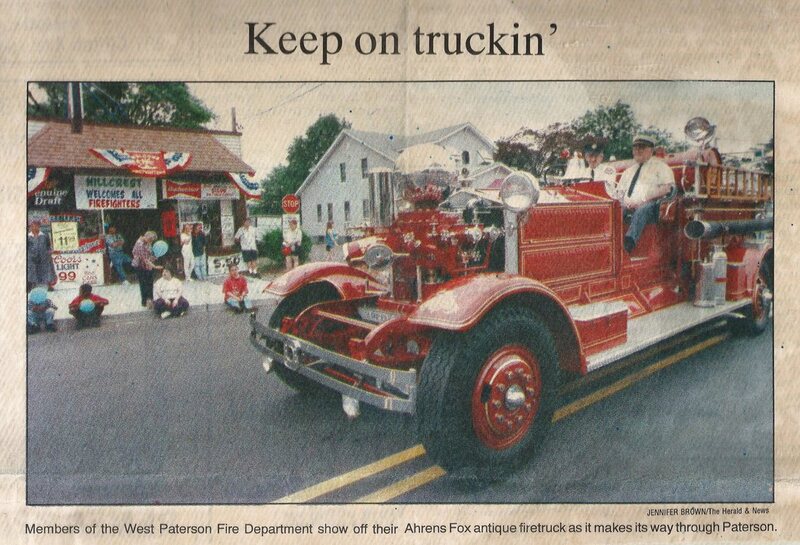 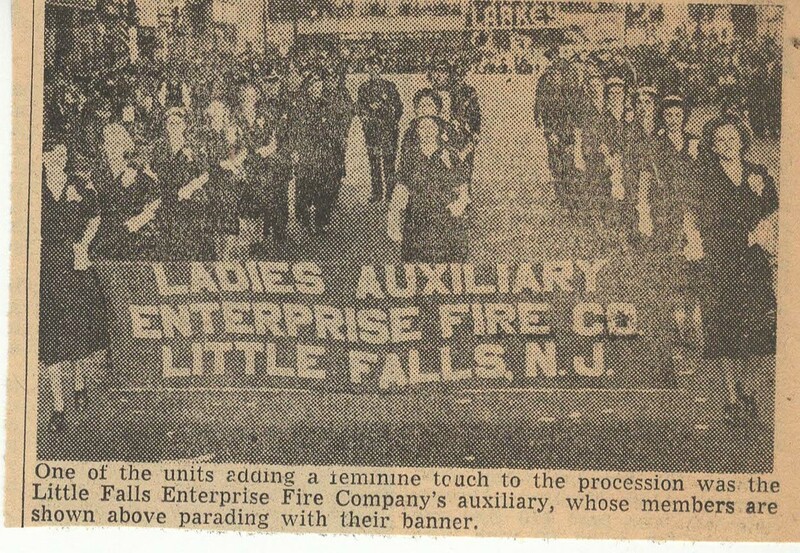 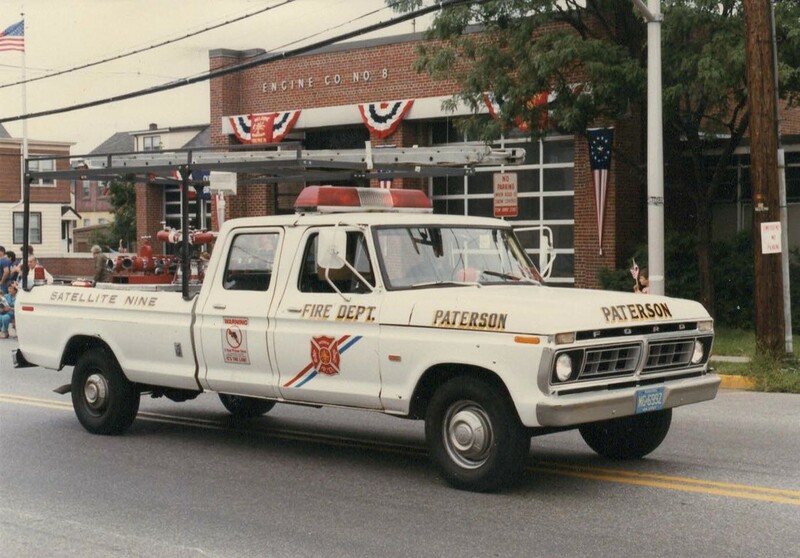 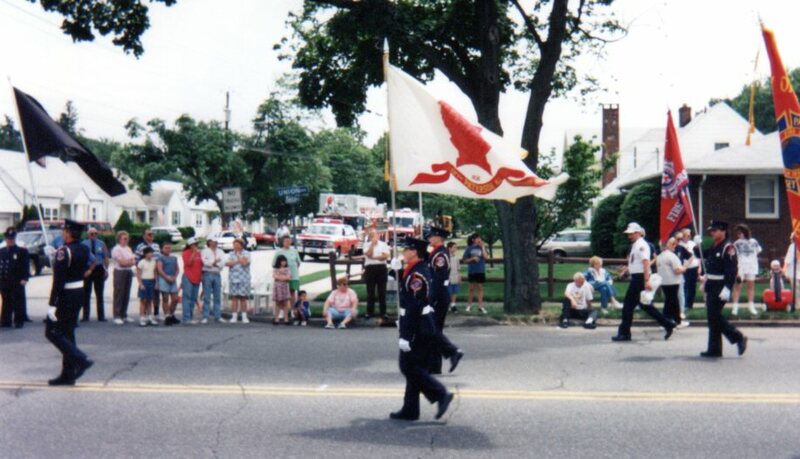 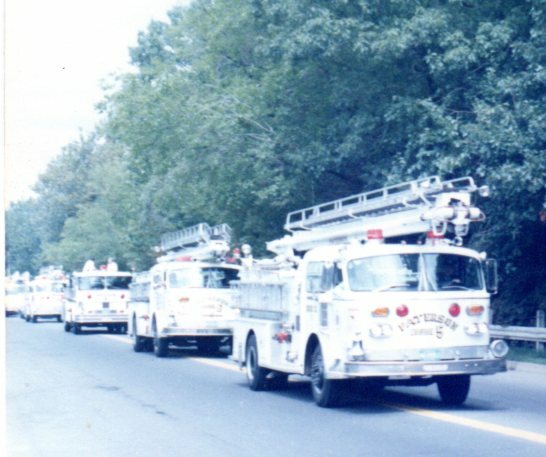 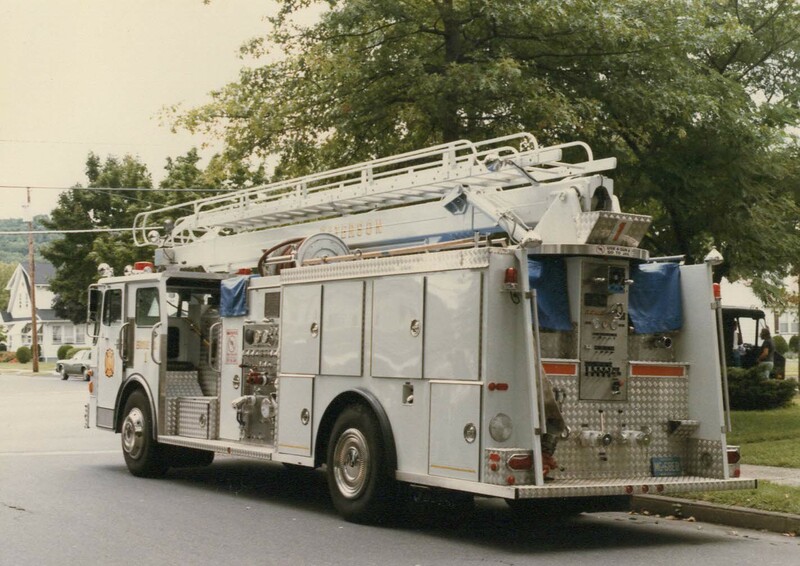 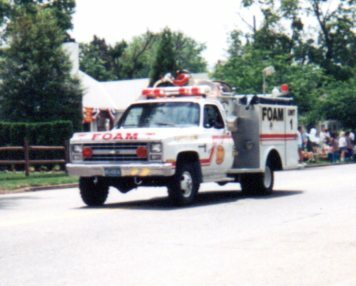 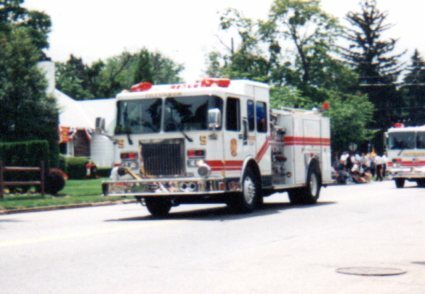 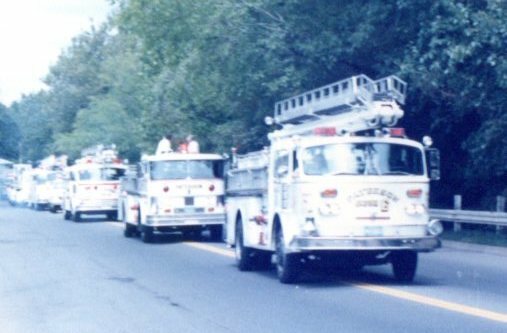 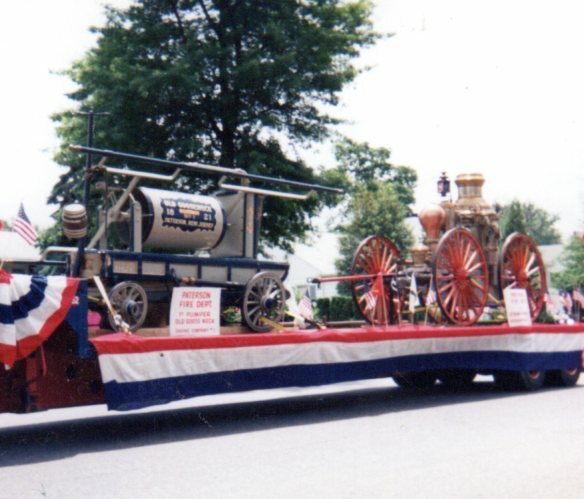 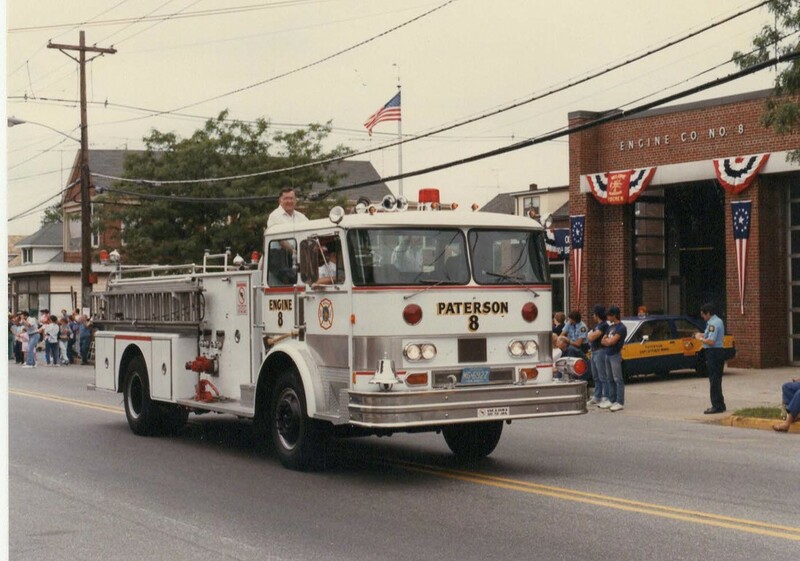 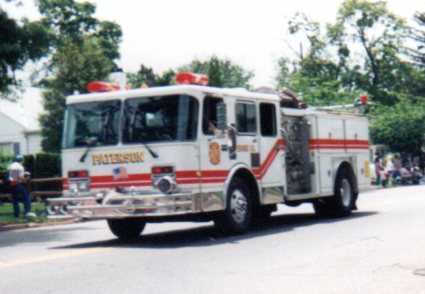 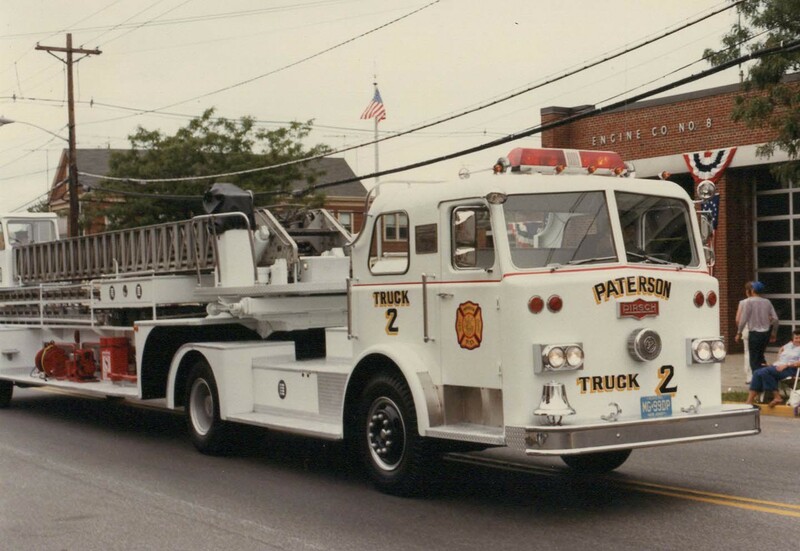 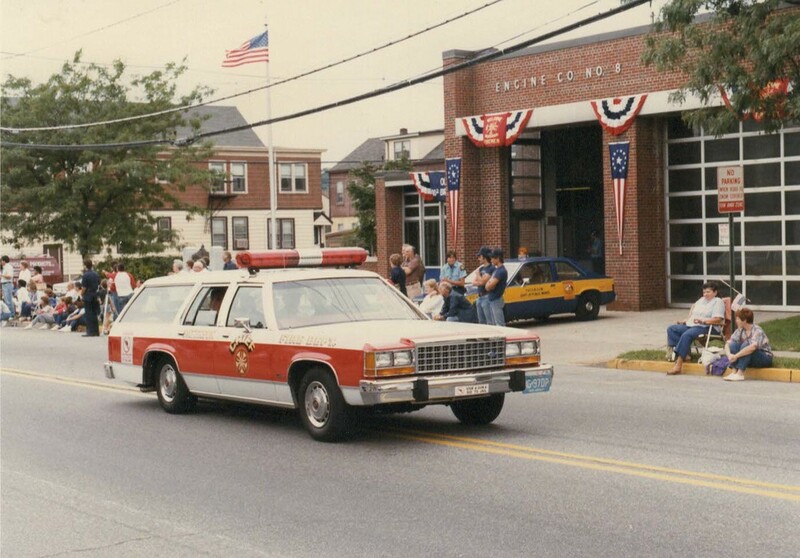 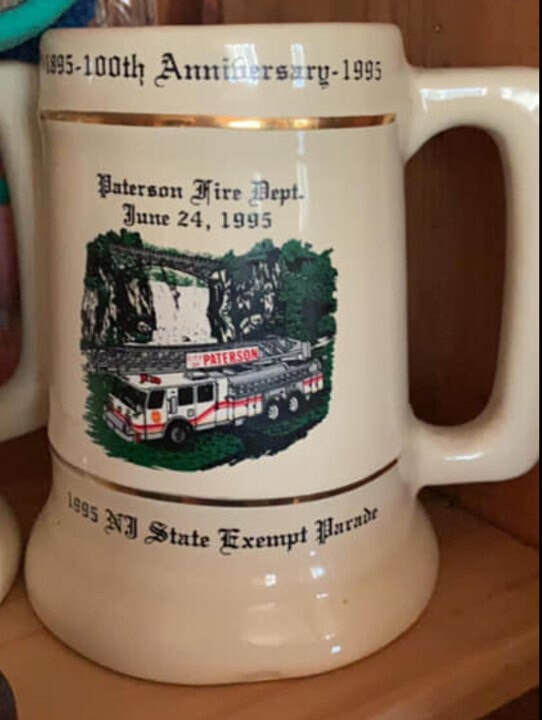 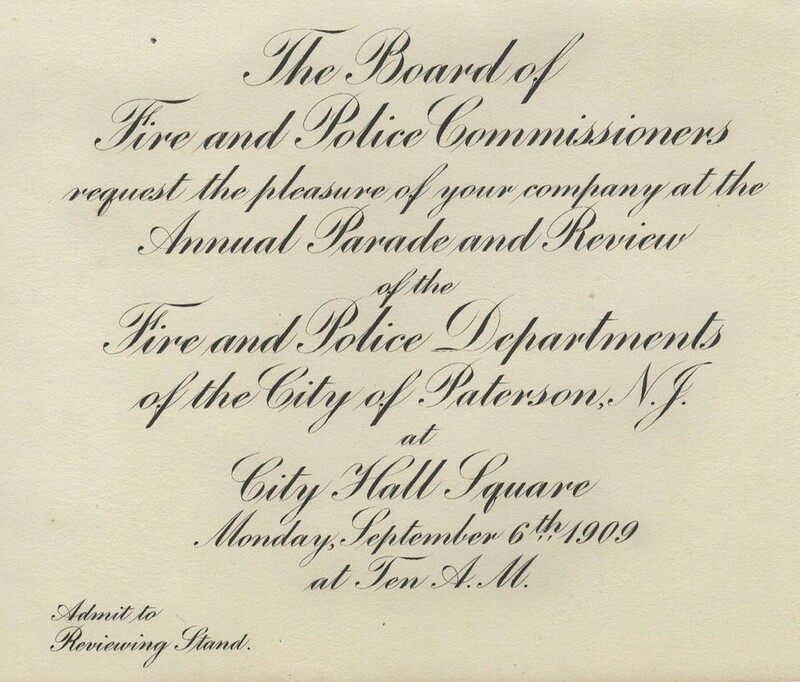 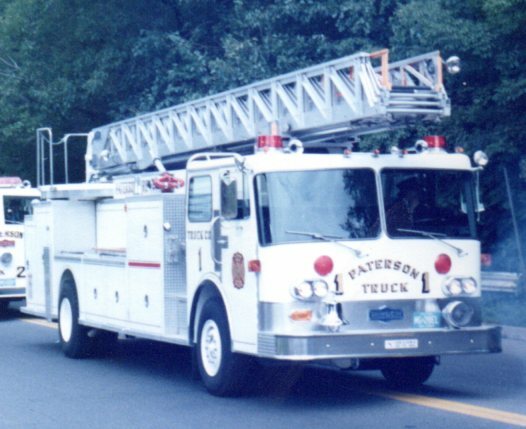 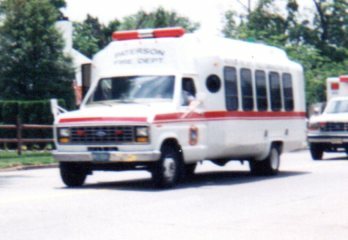 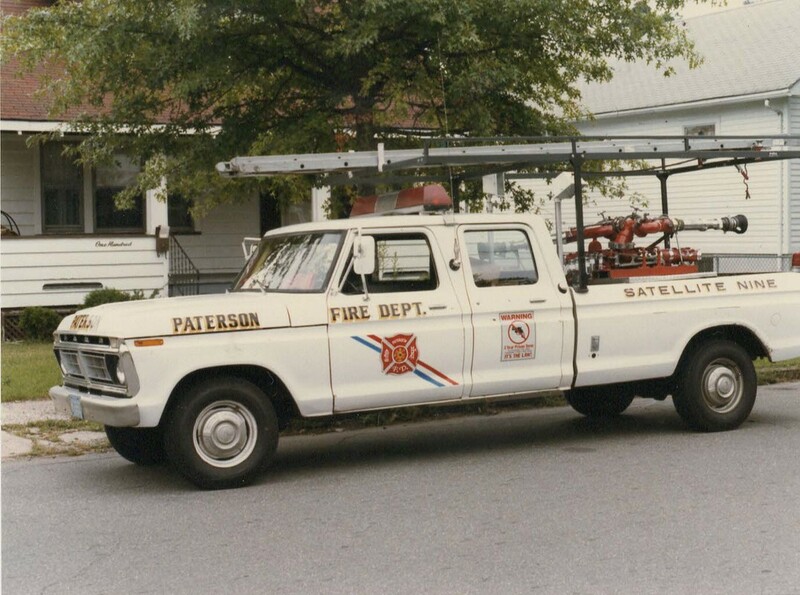 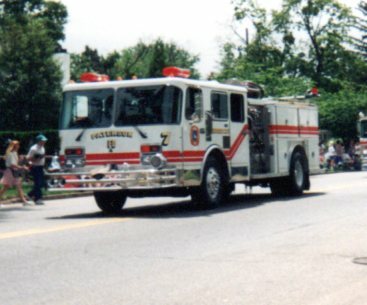 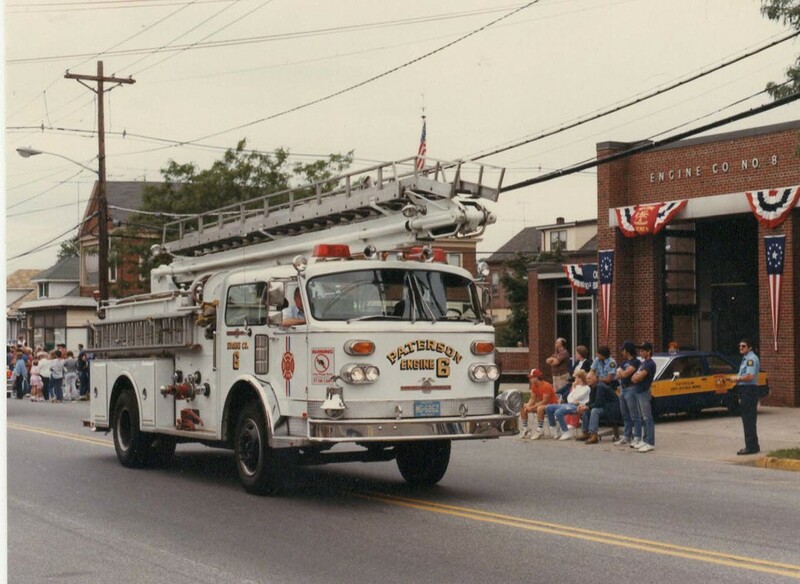 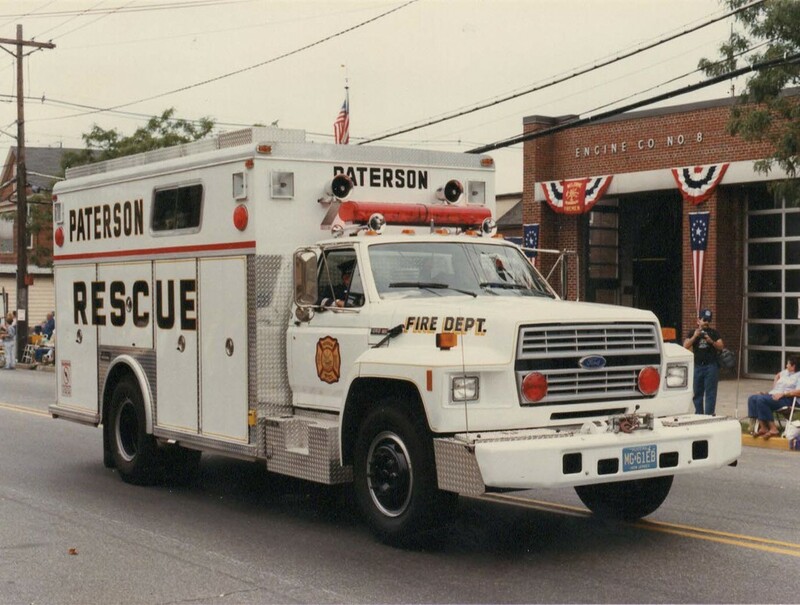 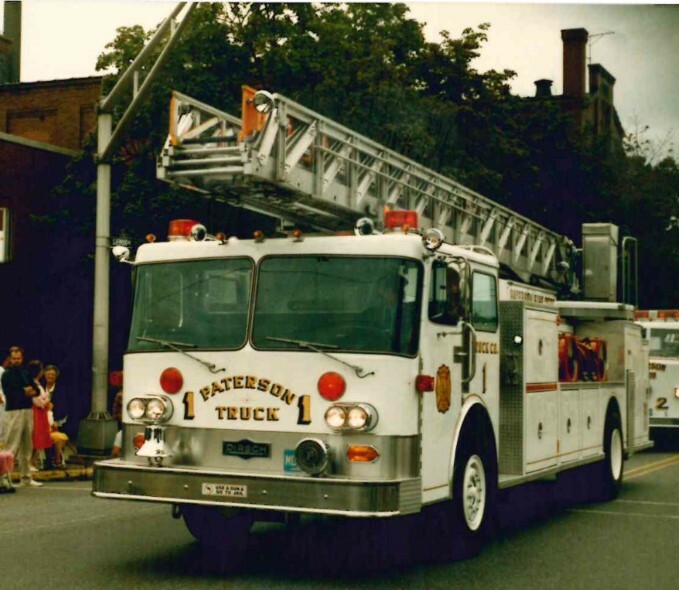 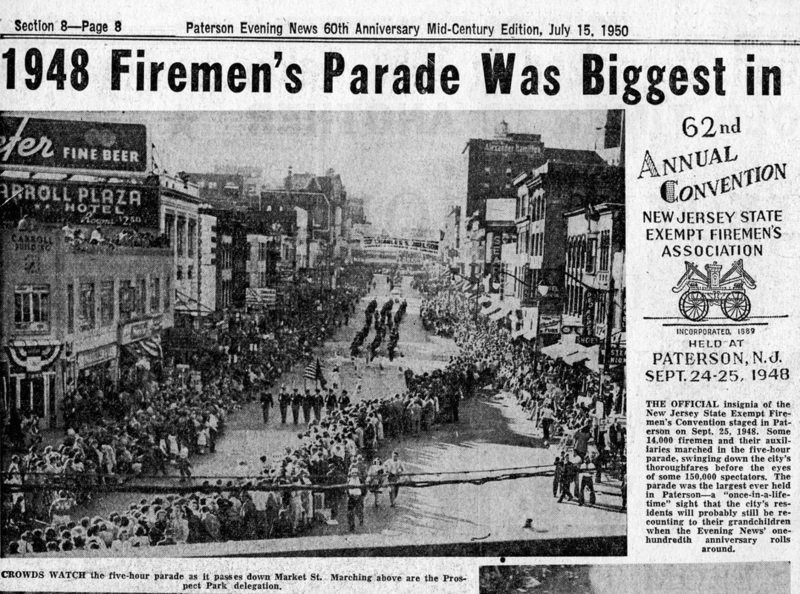 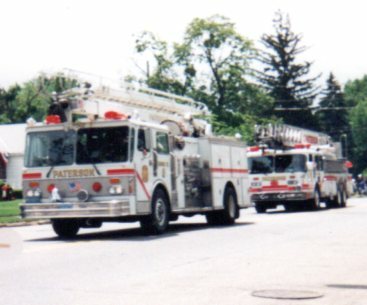 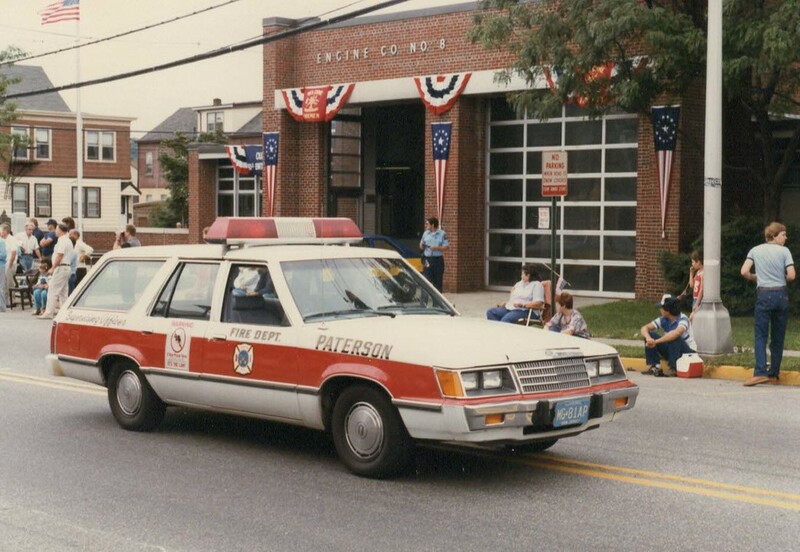 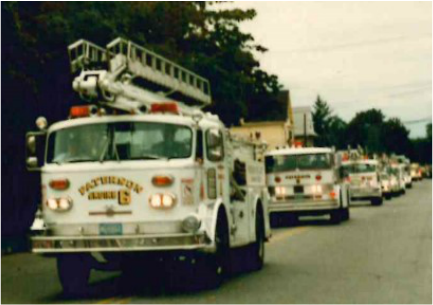 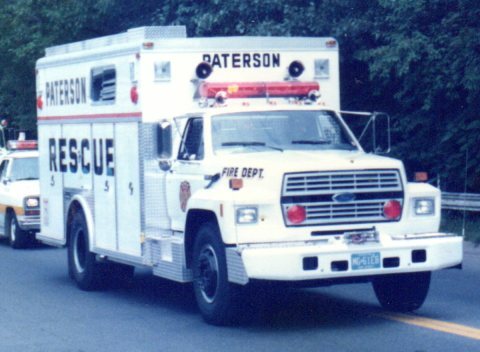 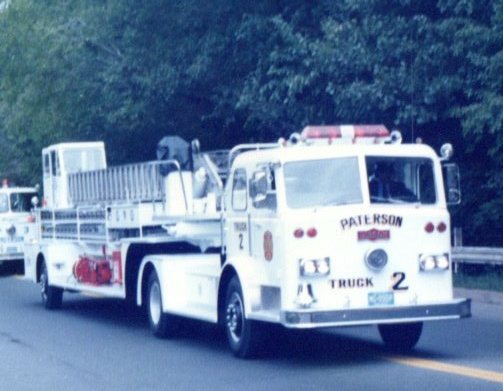 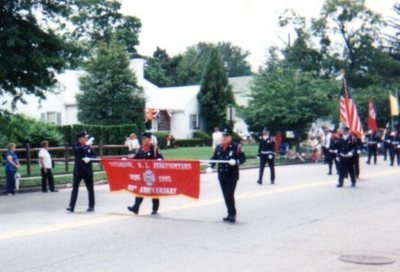 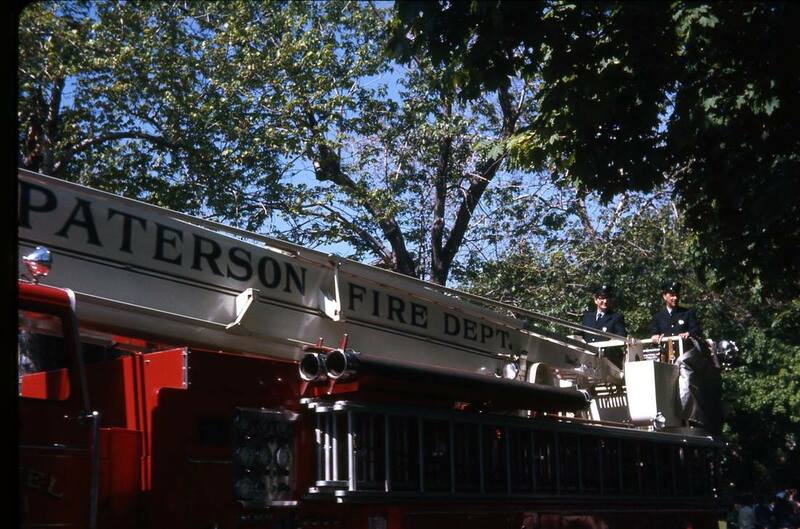 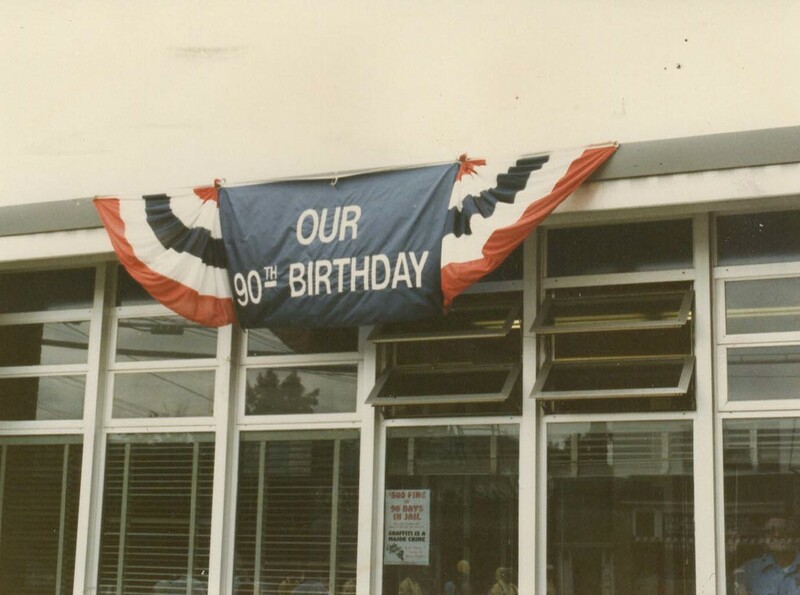 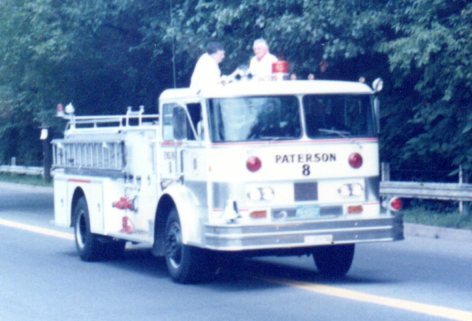 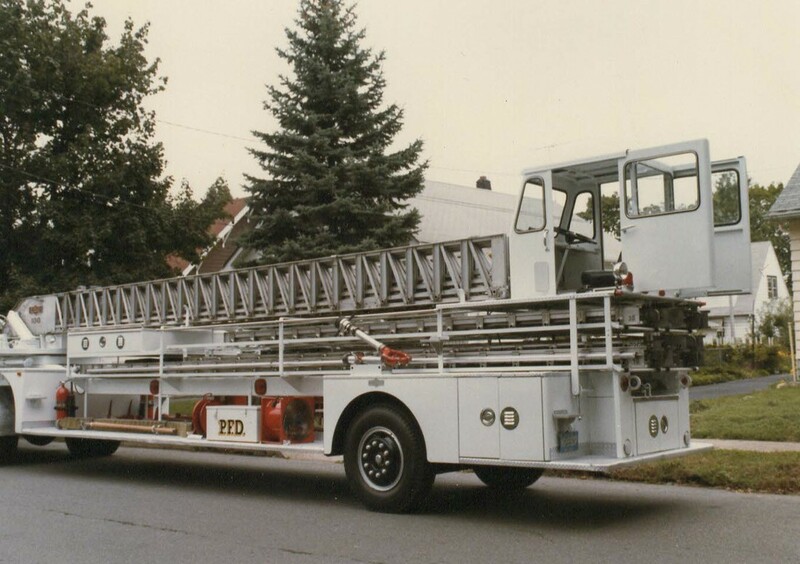 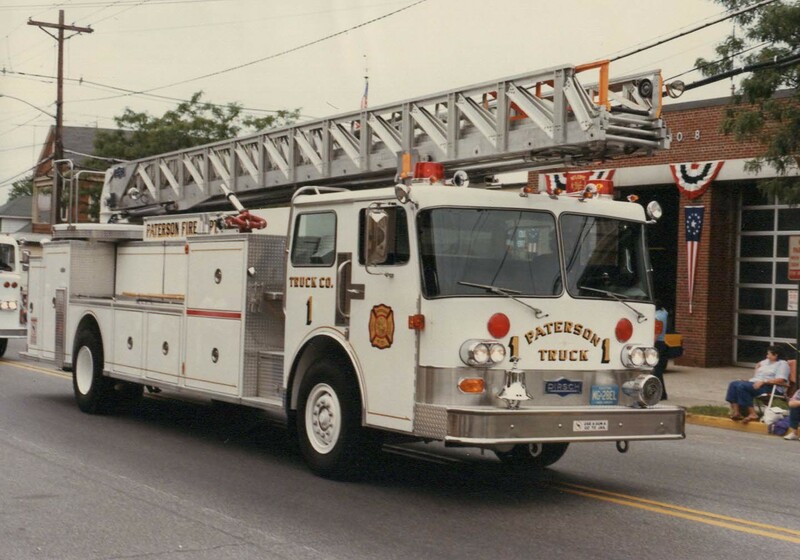 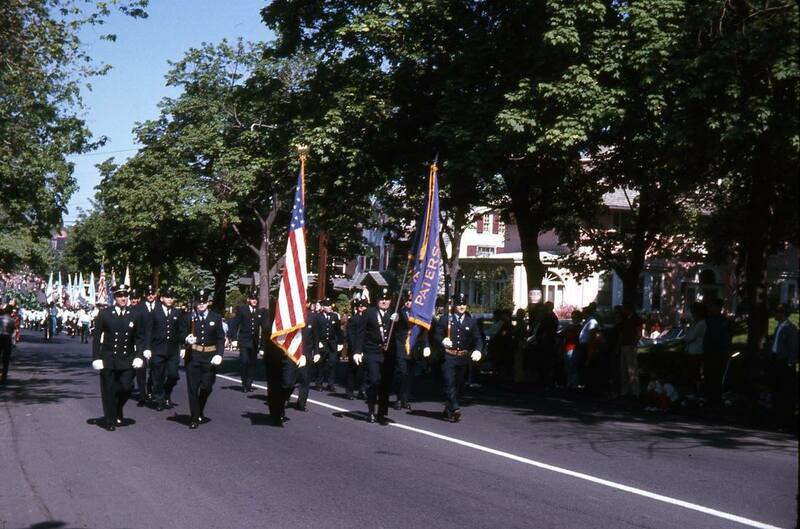 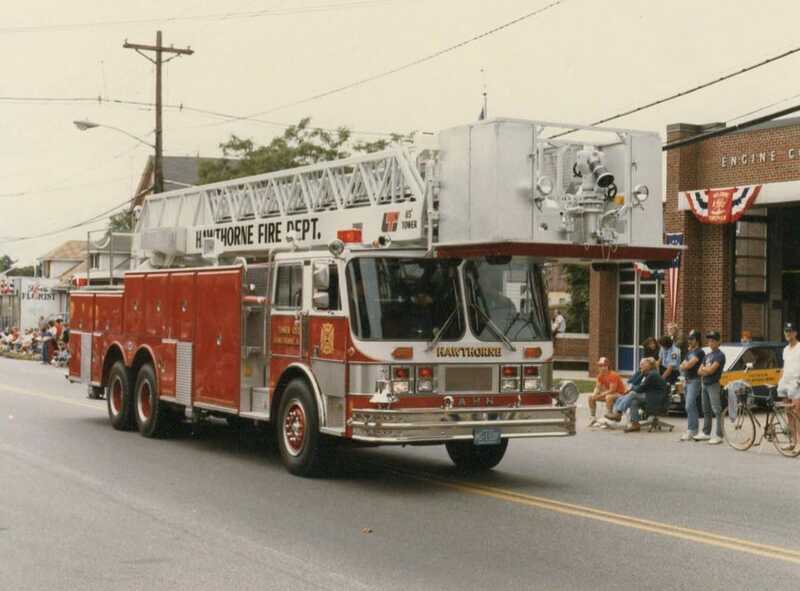 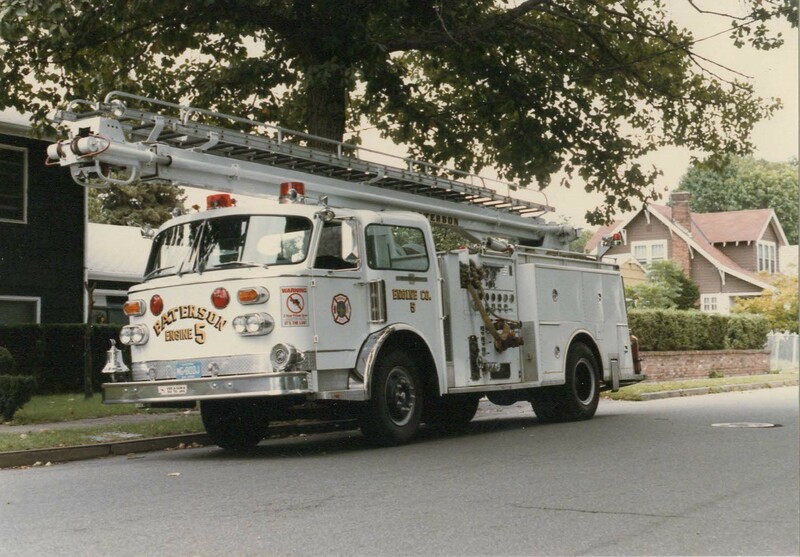 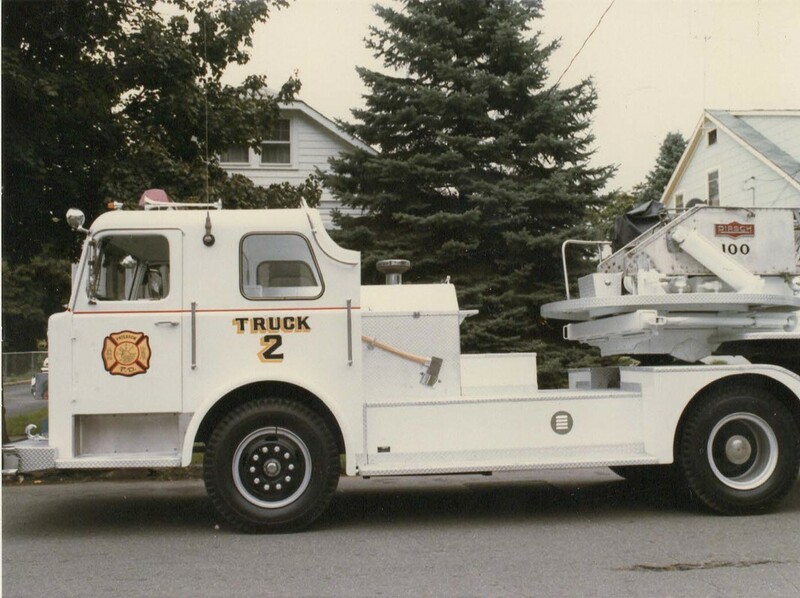 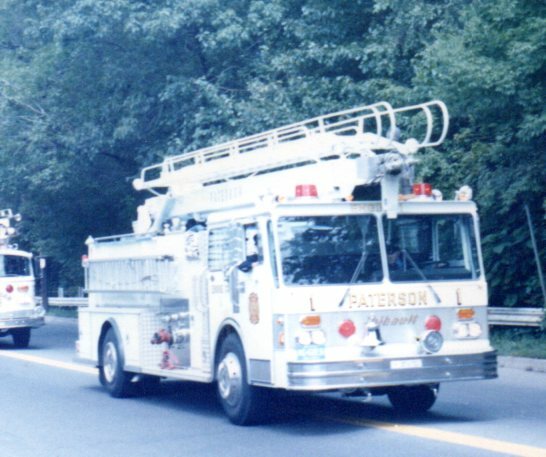 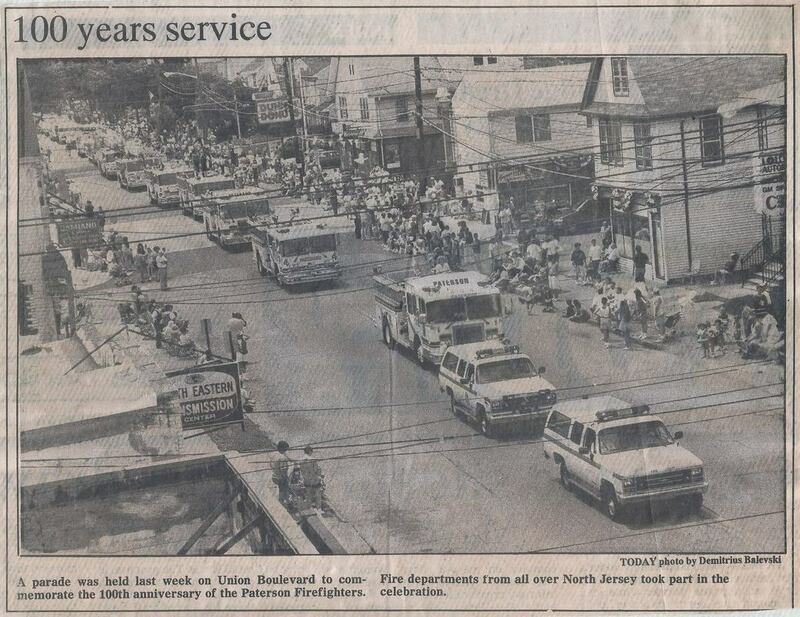 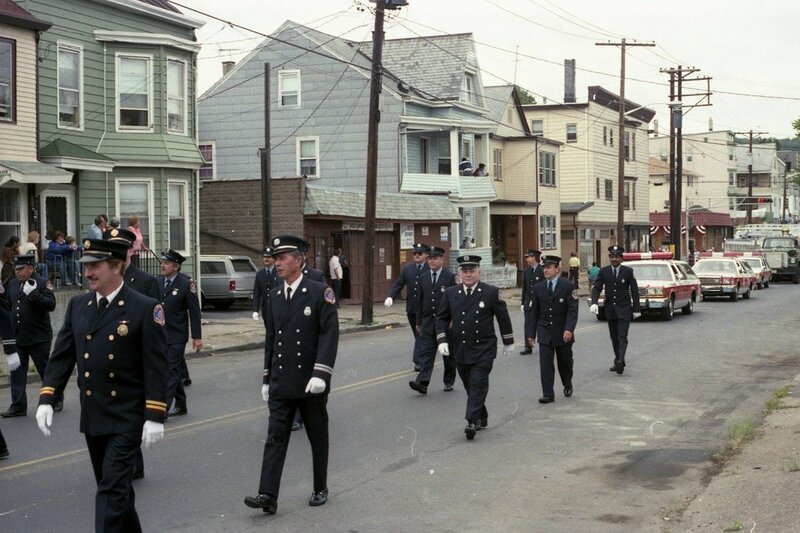 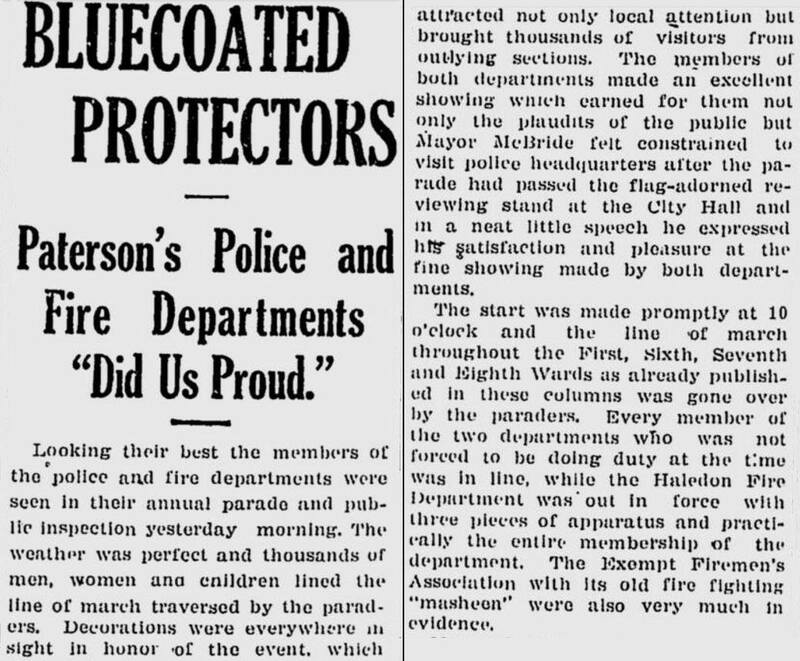 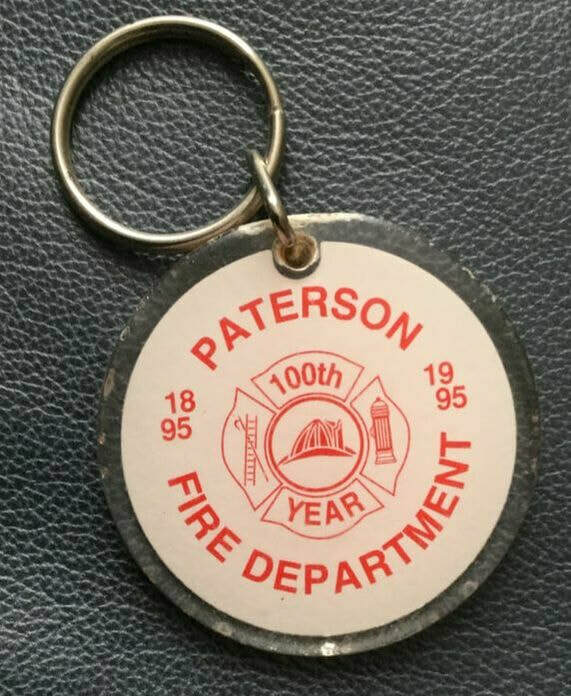 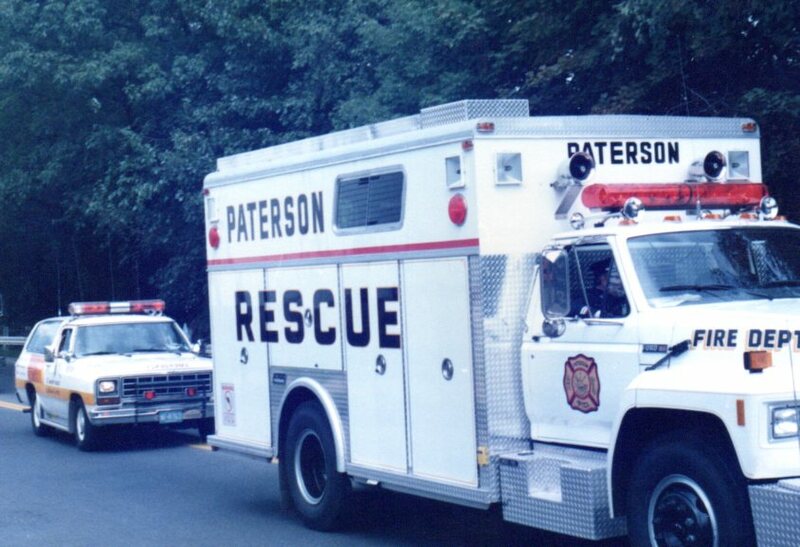 August 31, 1985: 90th Anniversary Parade Next series of photos taken by Thomas Dayspring were of apparatus passing Hillcrest Firehouse during parade as well as staging prior to parade on Elberon Avenue. Captain in the foreground is Tom Hirz. 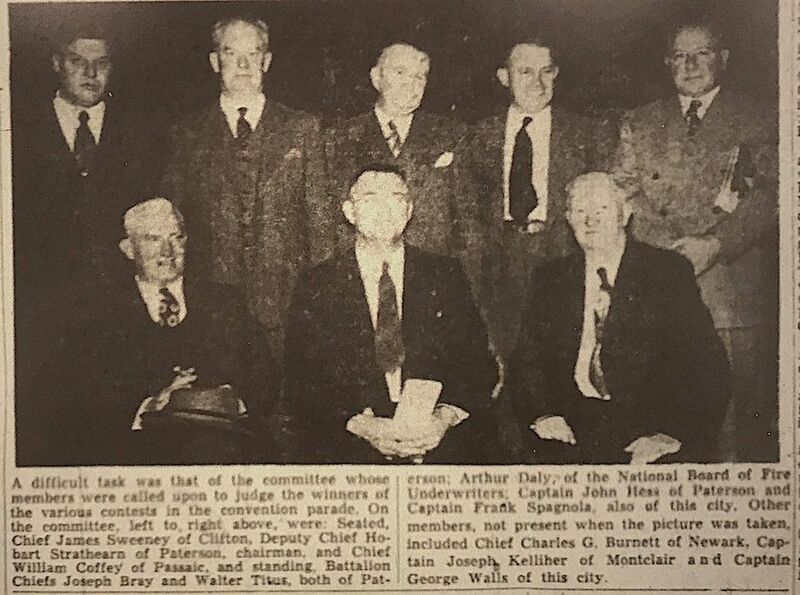 To his left is Captain Jack Duffy. 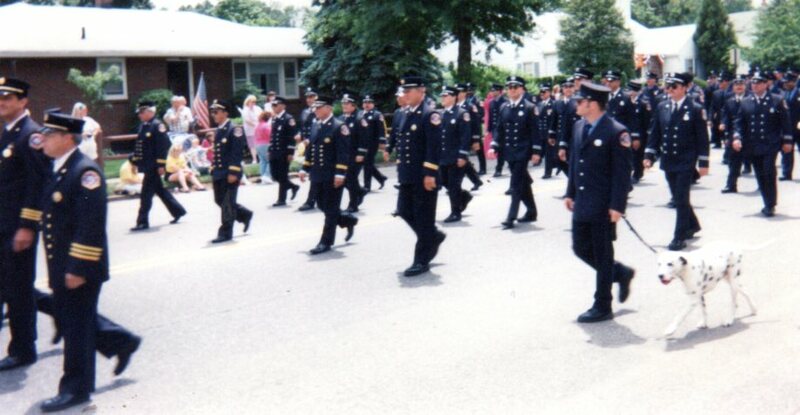 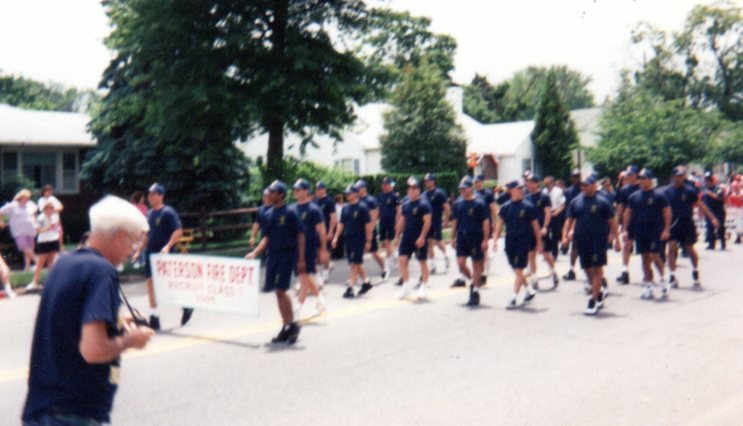 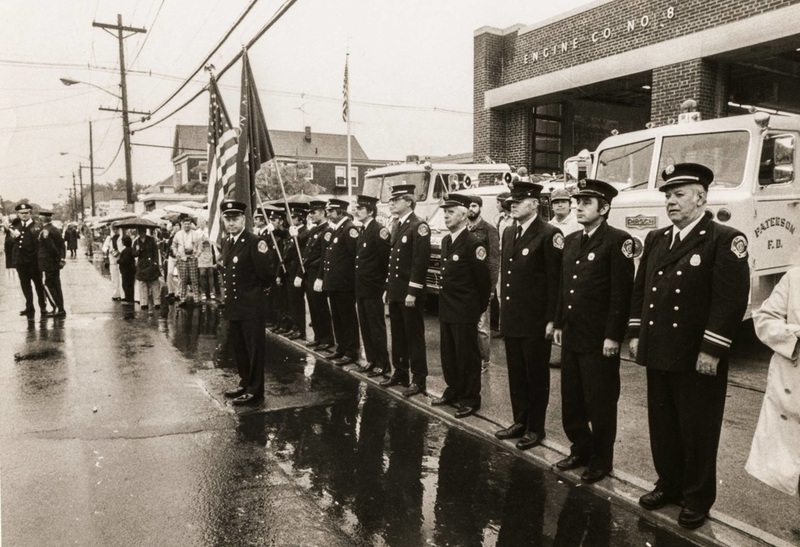 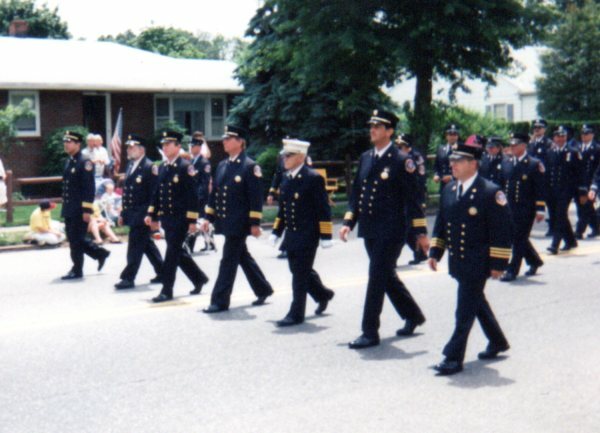 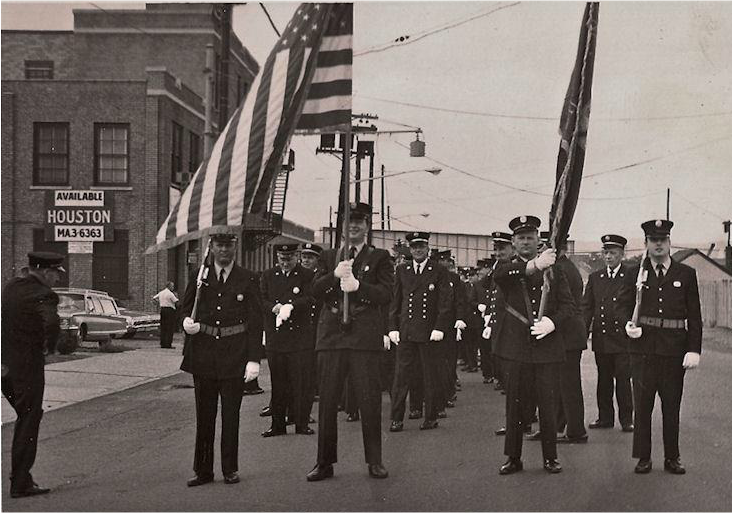 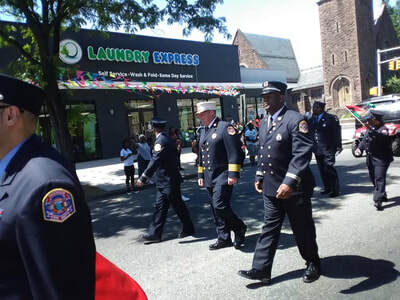 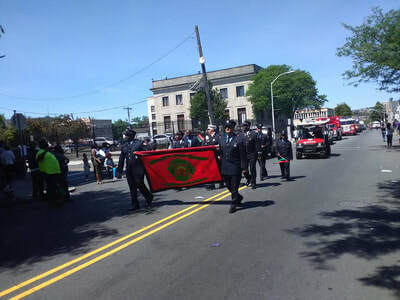 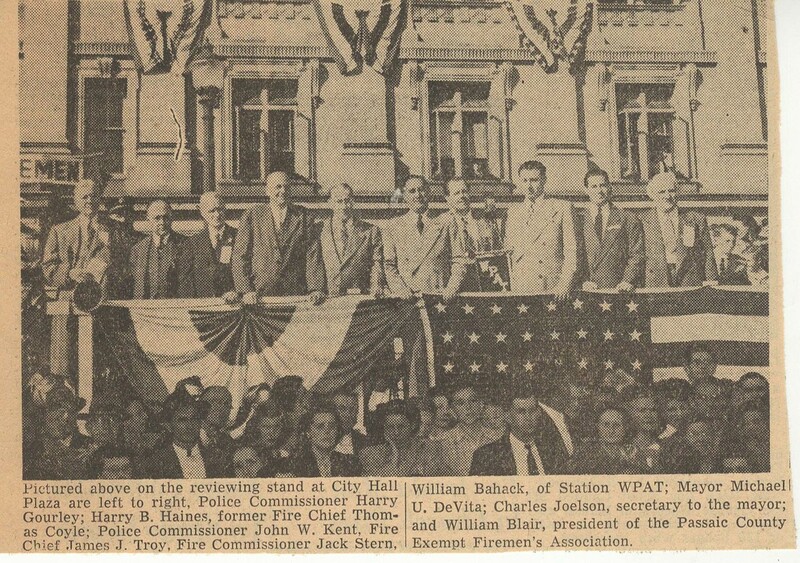 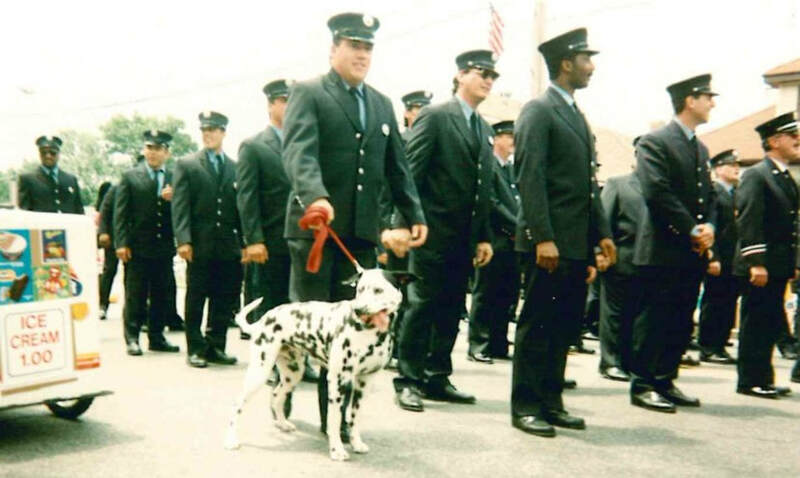 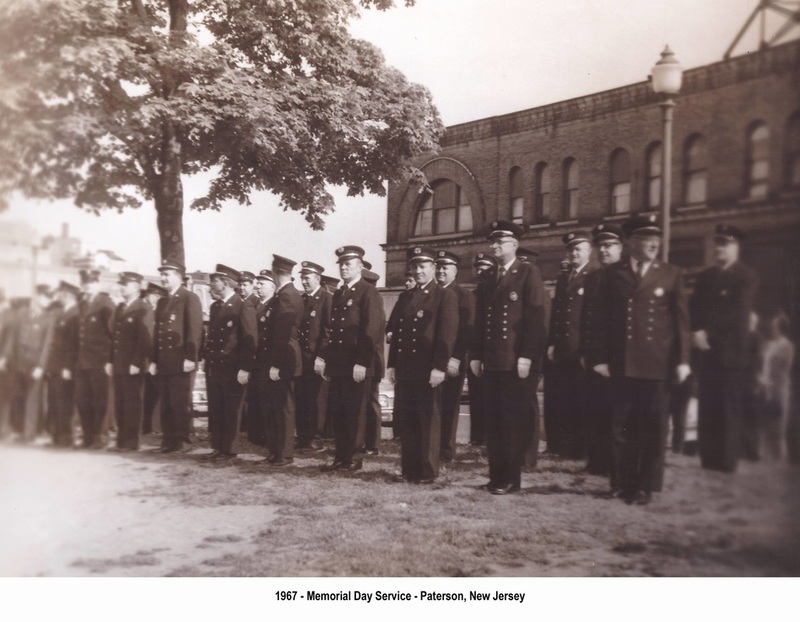 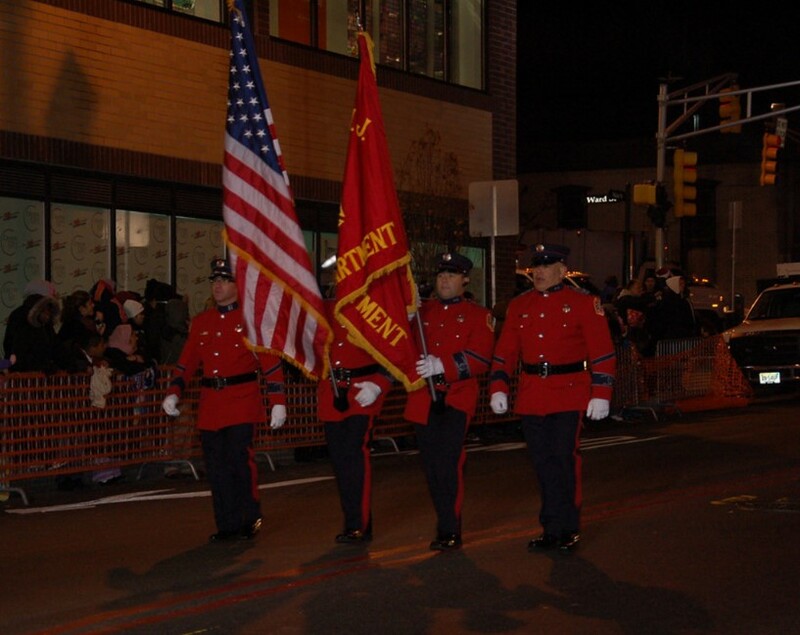 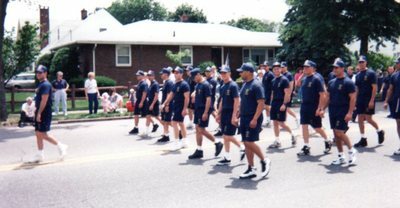 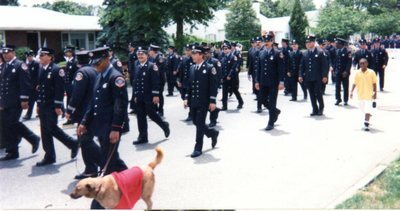 Second row foreground (right of photo) is firefighter Ed Olszewski. 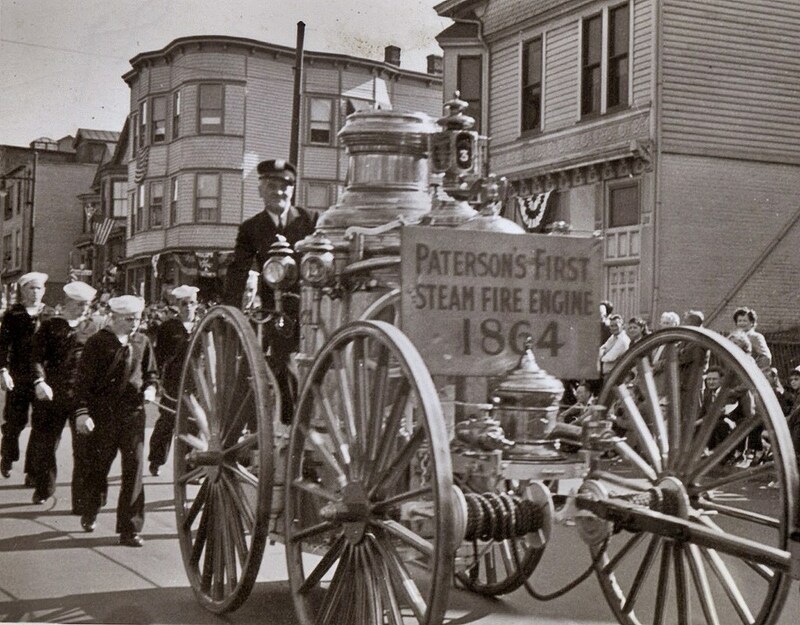 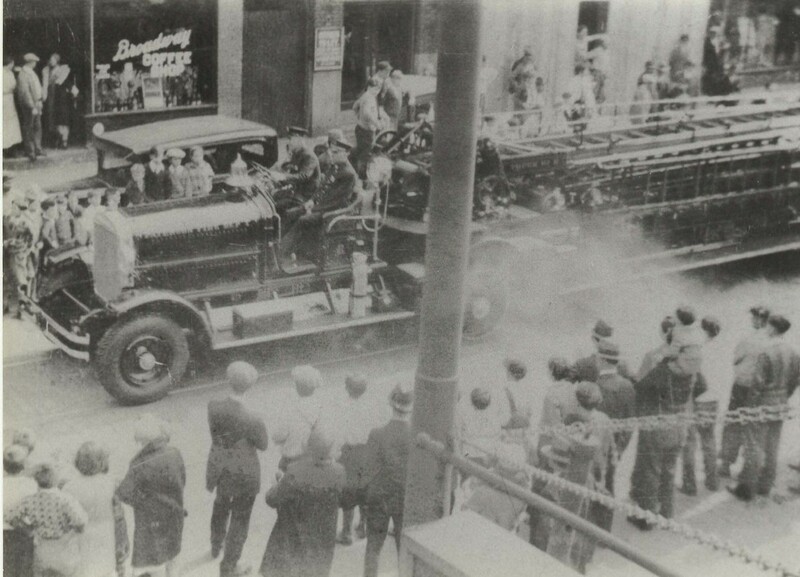 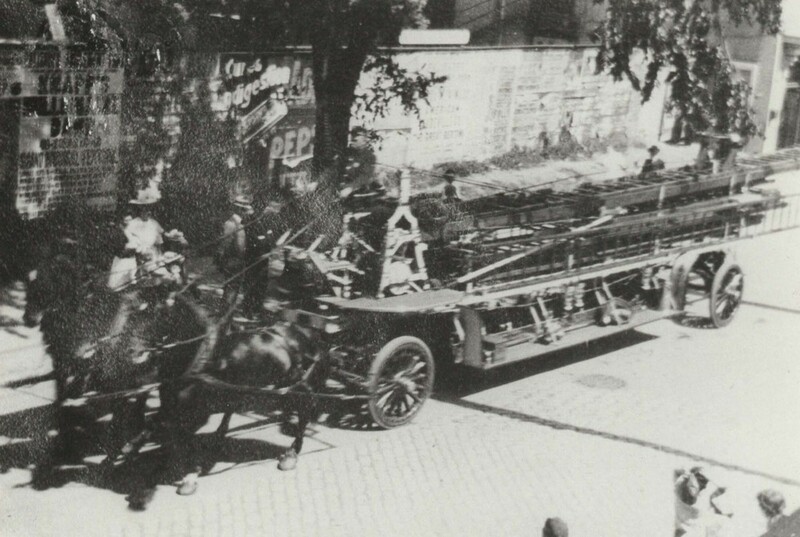 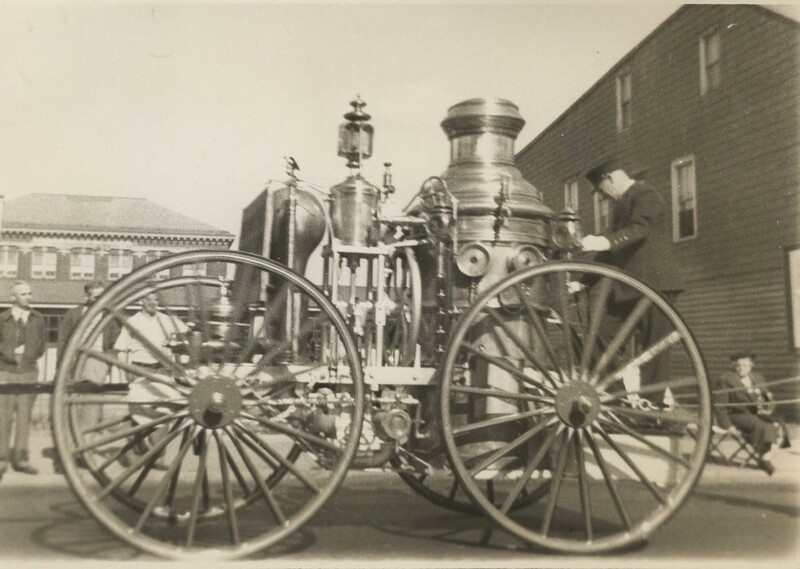 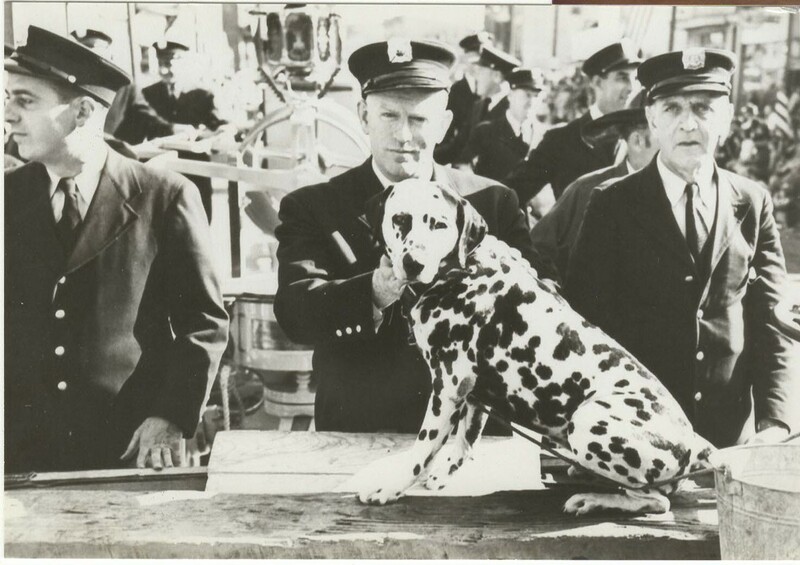 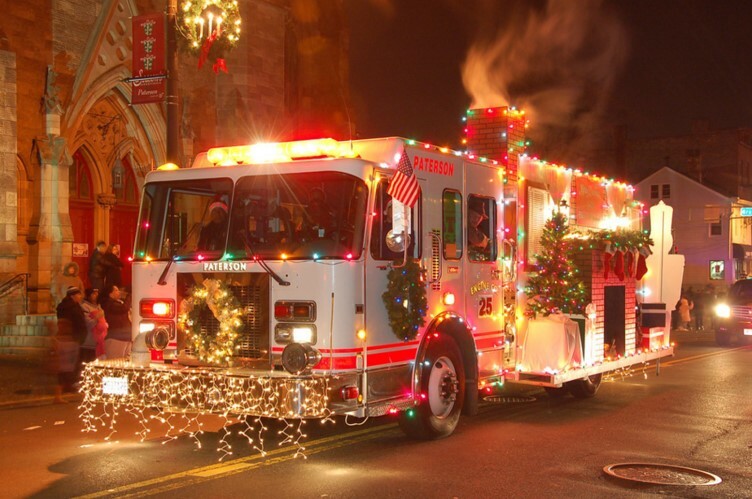 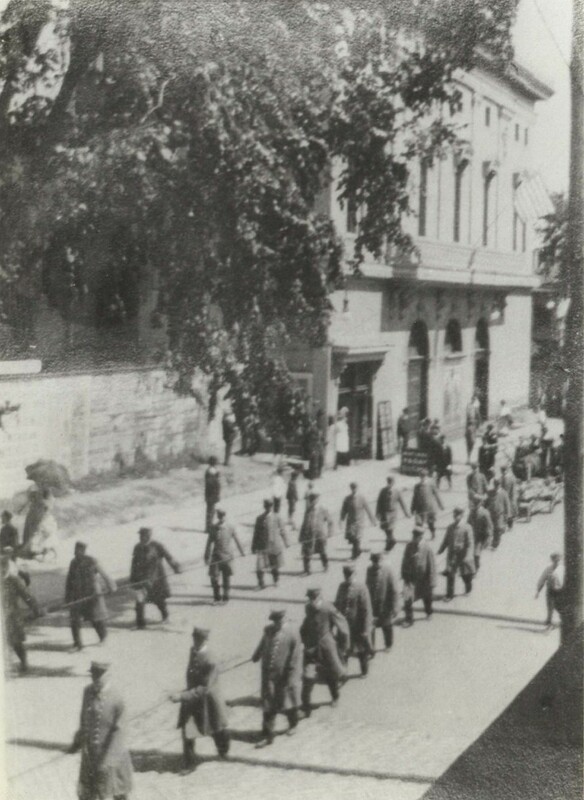 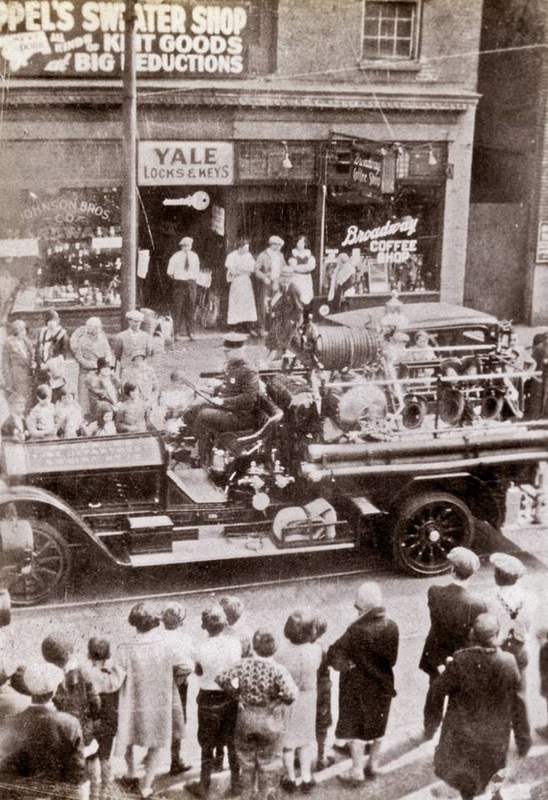 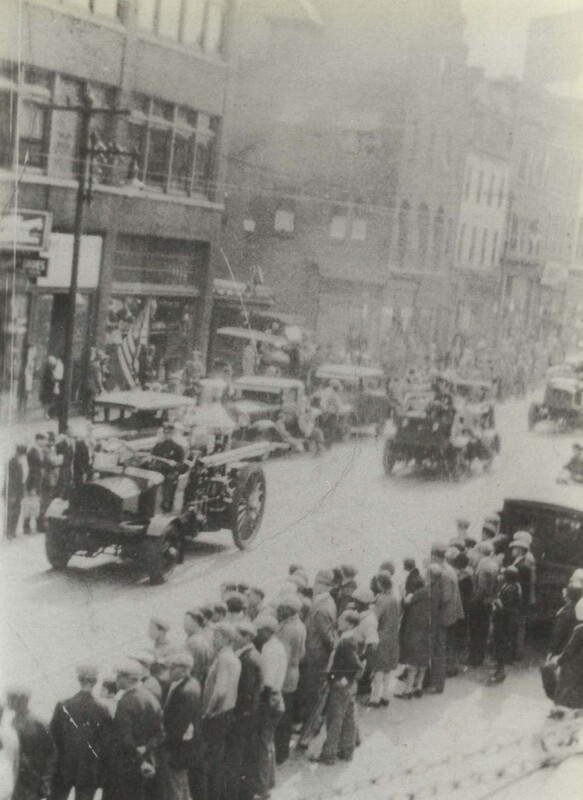 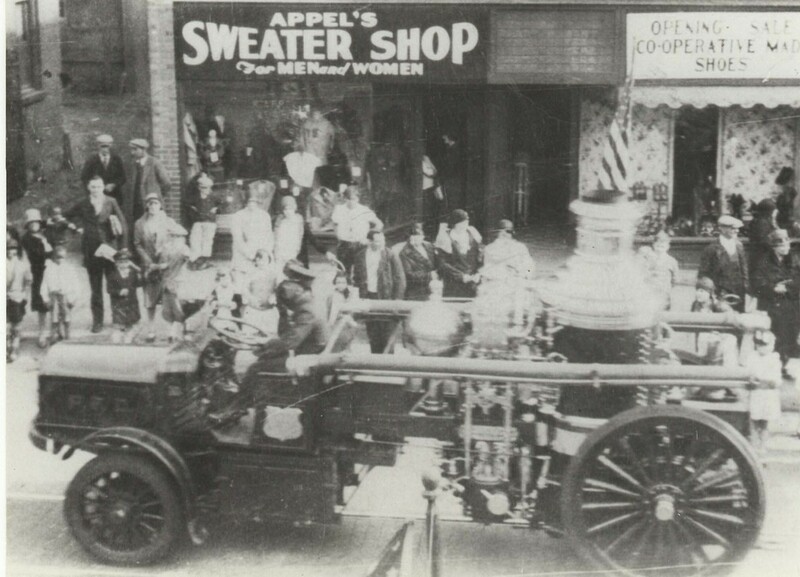 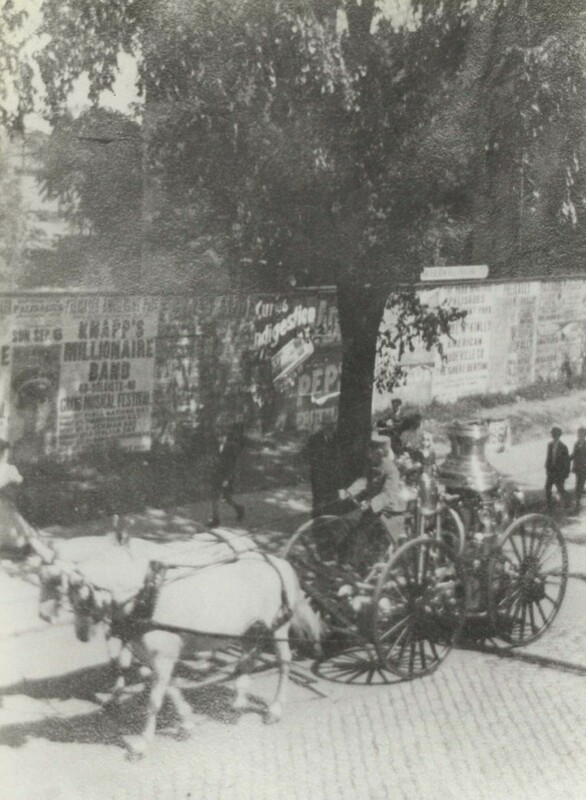 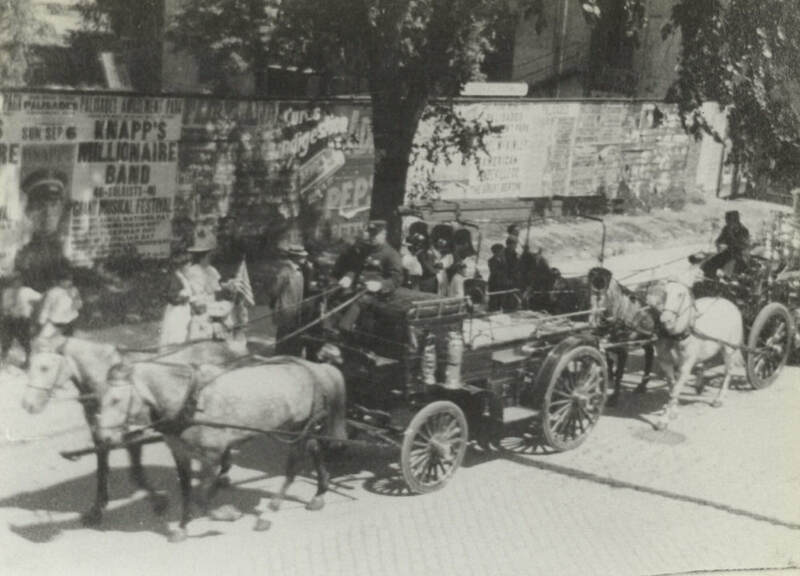 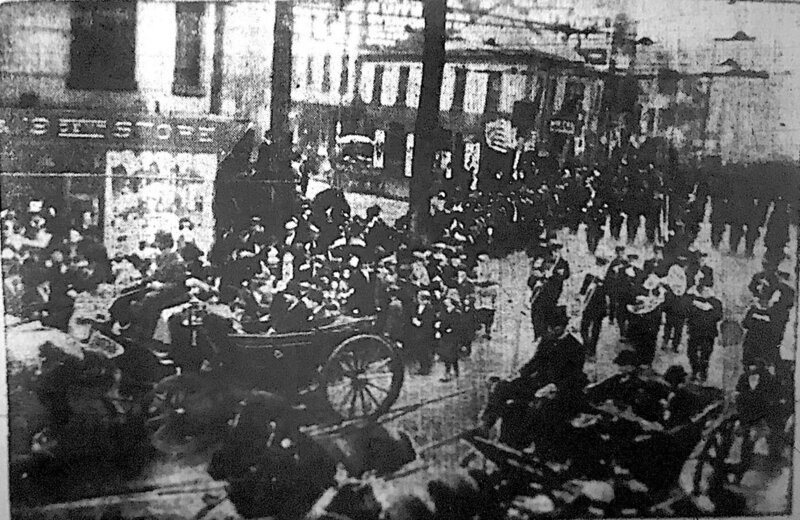 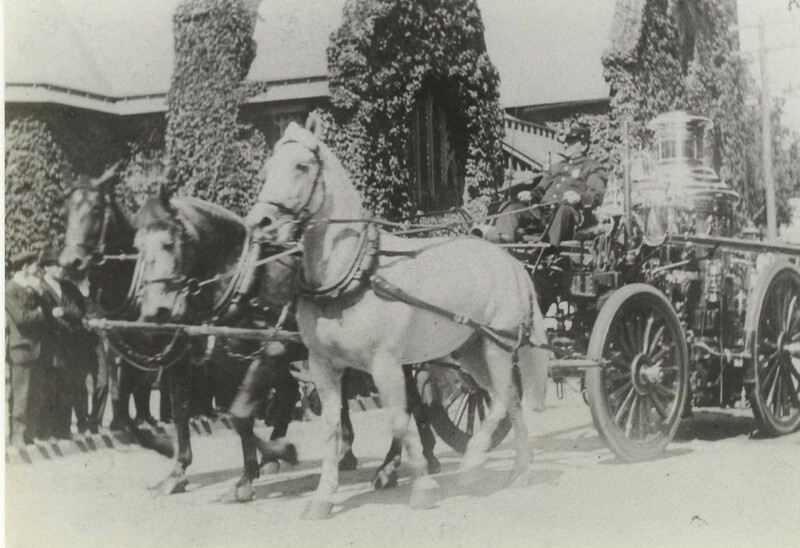 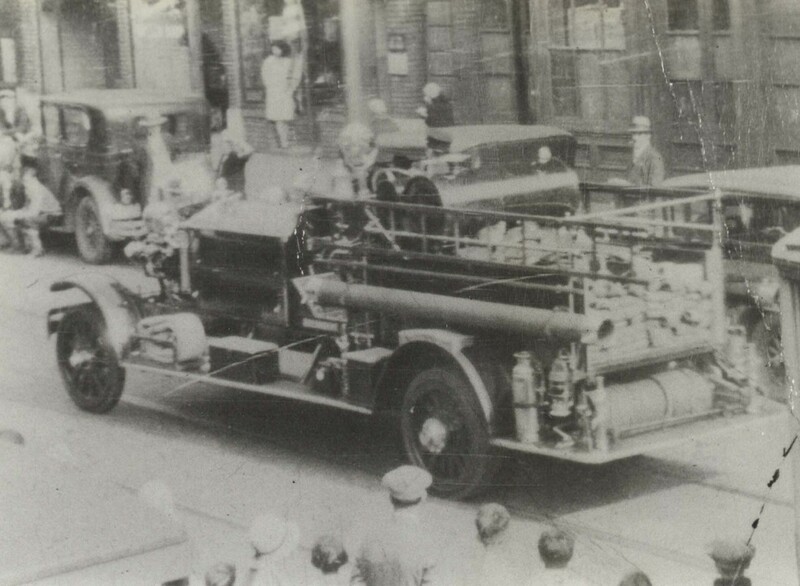 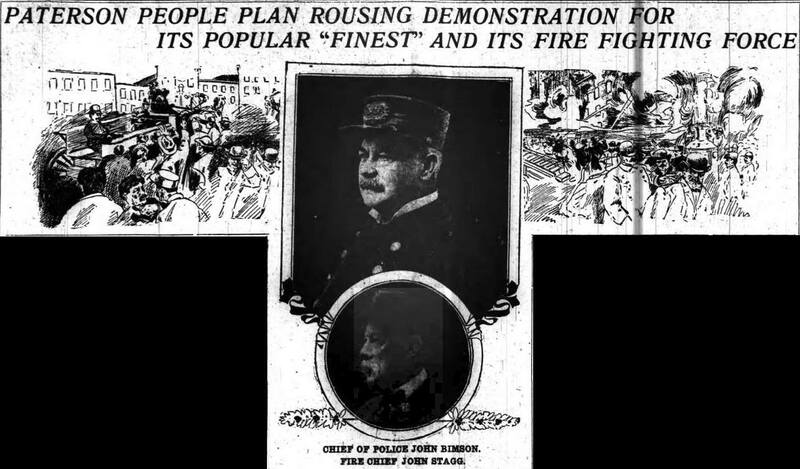 Unknown fireman in front with head turned. 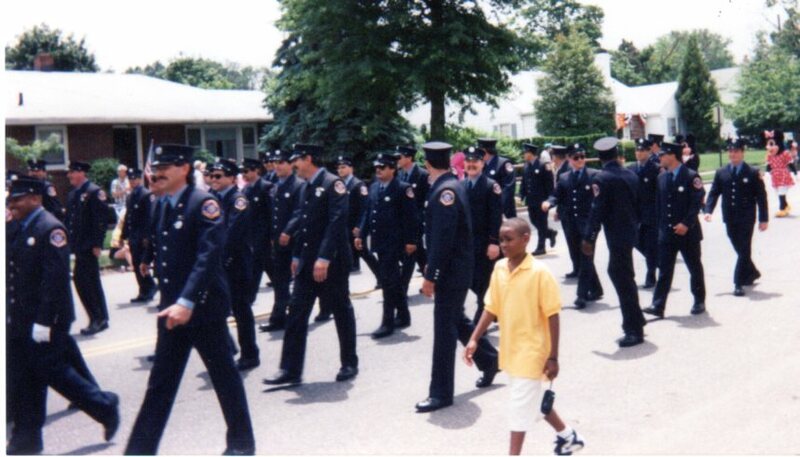 Front row next to fireman with head turned is is Captain Vito Mangani. 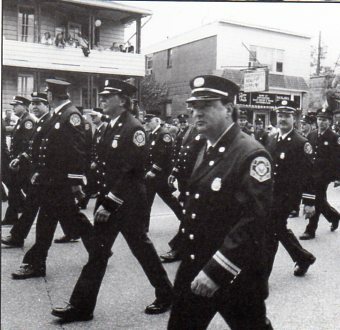 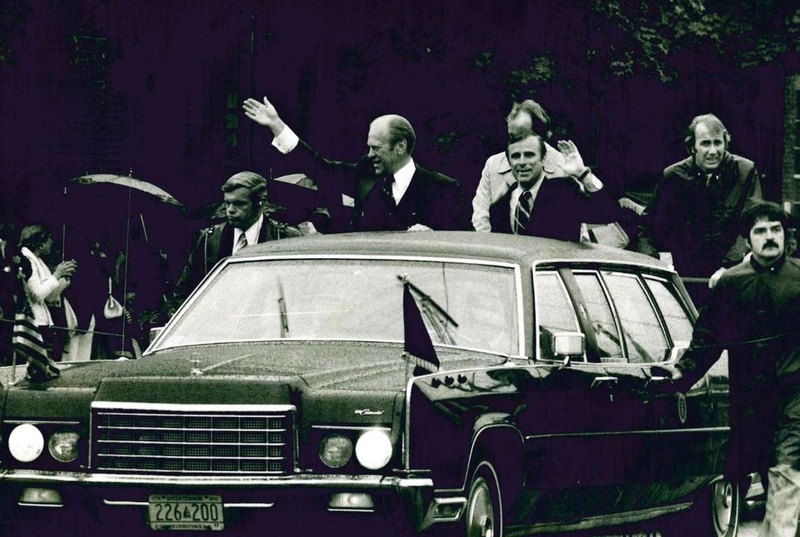 Directly in photo center in second row is possibly Earl Plavier?